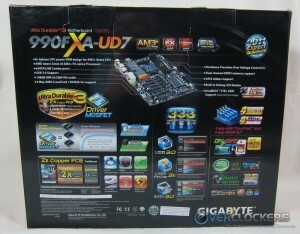 Today we’re back with another high end motherboard featuring AMD’s 990FX / SB950 chipset: the Gigabyte 990FXA-UD7. The last 990FX board we looked at was the ASUS Crosshair V Formula, which was quite impressive; does the UD7 have what it takes to compete? Let’s find out! 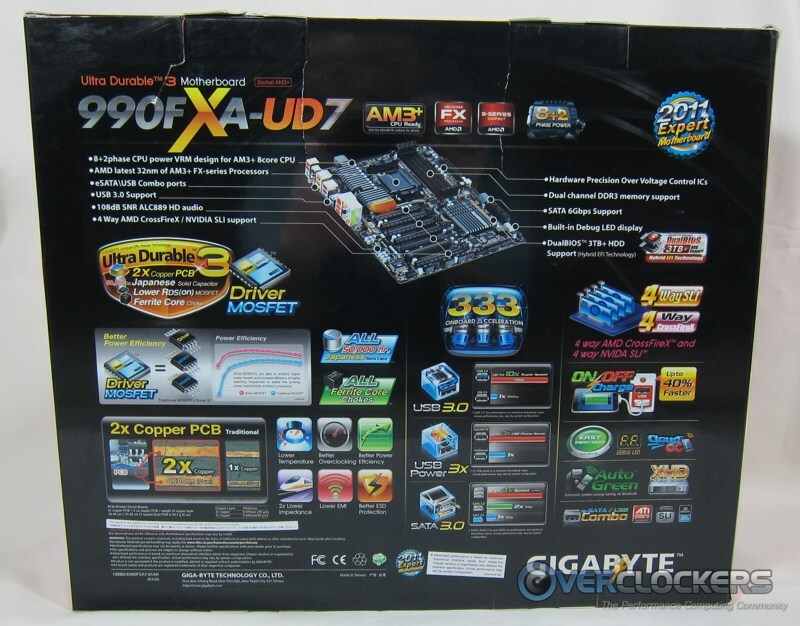 Like the 890FXA-UD7 before it, the UD7 packaging has a flap to show off the upper part of the board and to list some more features and marketing material. Once you pull the inner box out, you can see the that board and accessories are held in separate trays. This is not a bad job as box designs go. 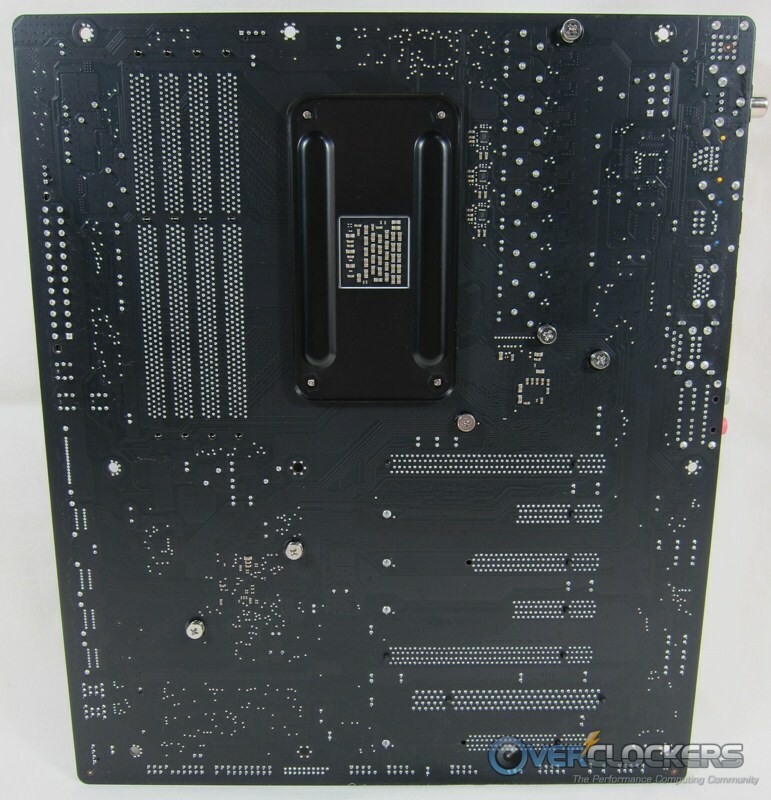 The board itself is a very good looking piece of hardware. I really like the look of this board. Based on looks alone, I can’t say which I’d prefer between this and the Crosshair V.
A very nice looking, clean board from top to bottom. One thing is for sure though: this board is huge. 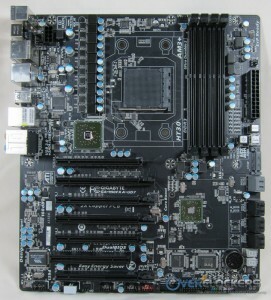 Whereas the Crosshair V is a standard ATX board and so is 24.4 cm wide, the UD7 measures 26.3 cm across. The ASUS Crosshair IV Extreme from last year was just slightly (0.6 cm) wider than this UD7. Based on looks alone, this board is a good contender; but looks do not a good overclocker make. Or so Yoda told me. Gigabyte’s feature and specification lists are just as long as everybody else’s. 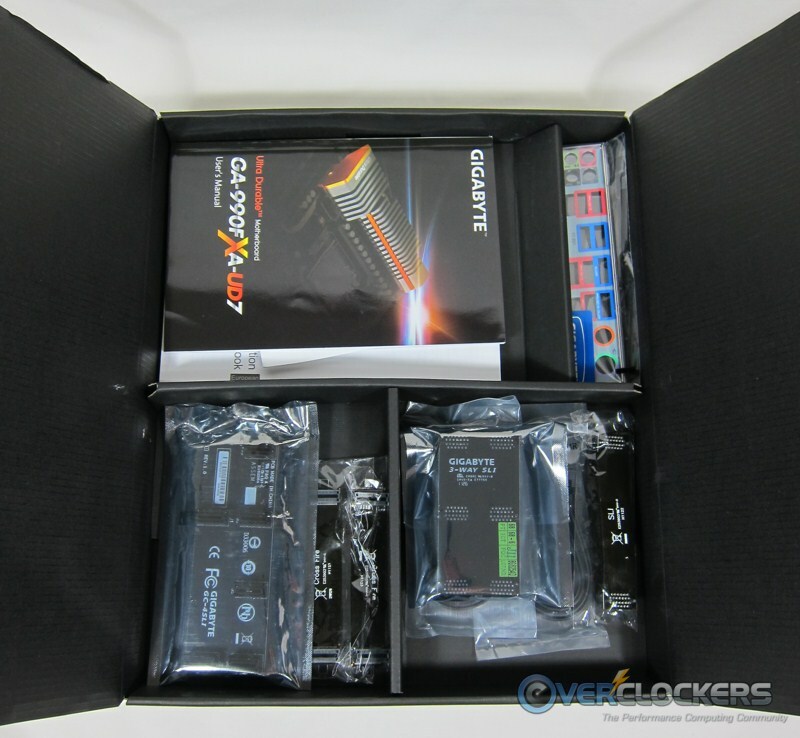 You can check out the full features and specification list at Gigabyte’s website. There are a few neat things in here from a usability standpoint – on/off charge and 3x USB power would come in handy for those that always have their phone connected to their computer. 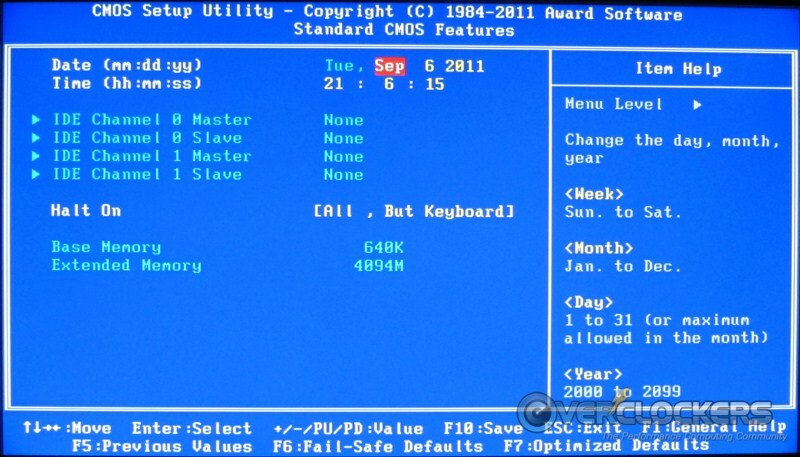 For instance, another neat feature is the Touch BIOS. 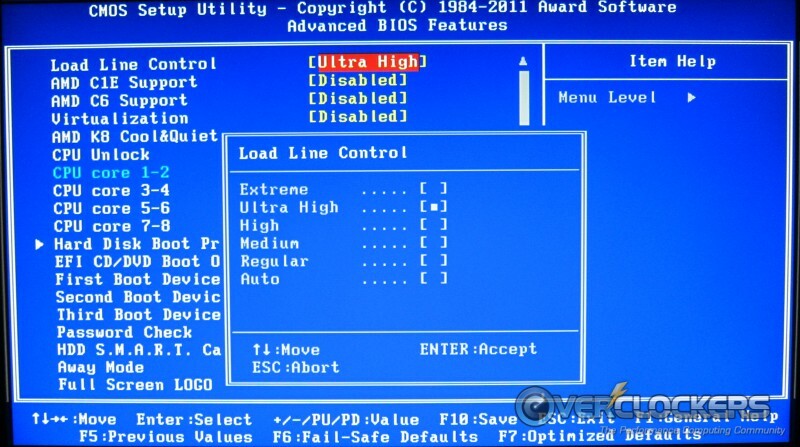 Navigating through the BIOS to change system settings can be a daunting task for users not familiar with control “F”functions and mouse-less navigation. 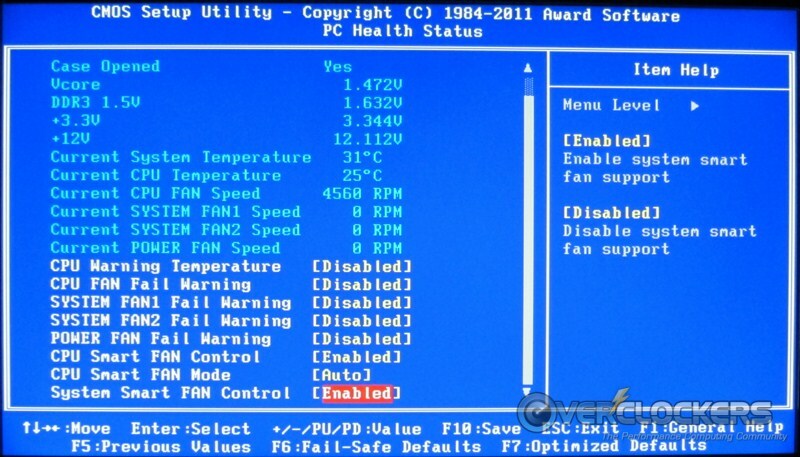 While some EFI BIOS try to address this with a mouse friendly environment, many implementations still lack a certain ease-of-use necessary for most people. With GIGABYTE Touch BIOS™, GIGABYTE engineers have completely re-imagined how users can interact with their BIOS, allowing for a more intuitive user experience. In fact, with a touch screen monitor, GIGABYTE Touch BIOS™ is as easy to use as most apps on your iPhone. But how many people have a touch screen monitor to use it? I’m going to go with slim to none at this point. They do have a downloadable program that you can use inside your OS. 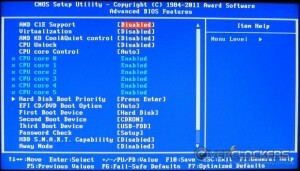 Unfortunately, it’s just BIOS manipulation and you have to restart to apply the settings. 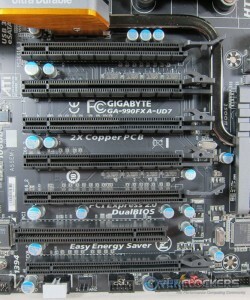 Others, like 4-way SLI / 4-way Crossfire are completely awesome. Flexible graphics capabilities – Up to 4 VGA cards are supported for either 4 way CrossFireX™ or 4 way SLI™ action (running at two x16 or four x8 bandwidth), delivering the ultimate in graphics performance for gaming enthusiasts who demand the highest frame rates without compromising on resolution. No other AMD board out right now has that capability; a definite graphics coup for Gigabyte. 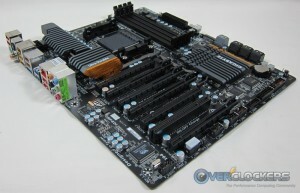 Gigabyte makes a big deal out of their power section on this board and one would think rightly so. It’s a stout, 8+2 phase design. Unfortunately, there are issues with the design that we’ll get into later. Just know that with this iteration of the board, it’s not what all the marketing says it’s cracked up to be. This motherboard designs with Split Power Plane, 8+2 phase VRM to support AMD the latest 45nm AM3 Phenom™II series processors, delivering the great performance enchantment to system and ultimate scalability hardware expending. A traditional Voltage Regulator Module (VRM) consists of a Choke, Capacitors, MOSFETs and a Driver IC. By incorporating the MOSFETs and driver IC in accordance with the Driver-MOSFET specification, we can achieve higher power transfer and increased efficiency at higher switching frequencies to satisfy the growing power requirements of today’s processors. 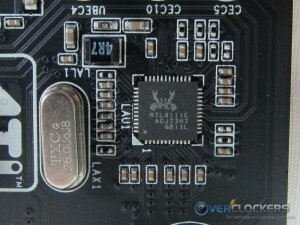 Driver-MOSFETs also help to reduce VRM real estate requirements in the CPU zone. 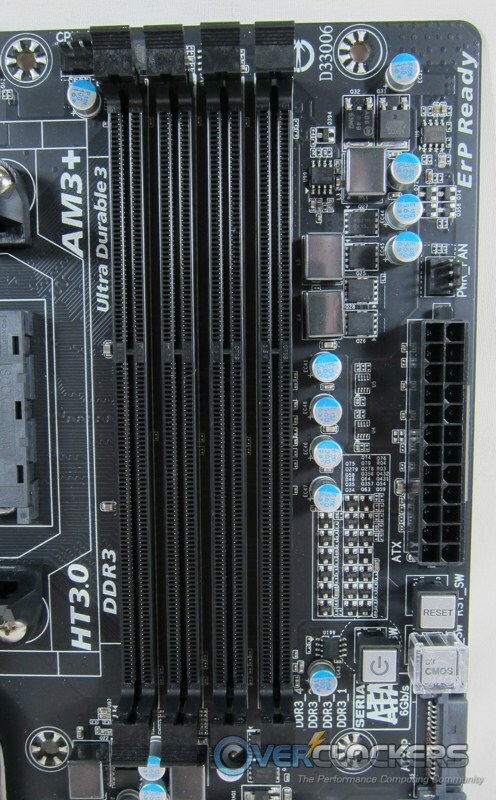 UD3 is Gigabyte-specific. They have had this for a couple generations now and it has proven to be a solid base on which to build their motherboards. 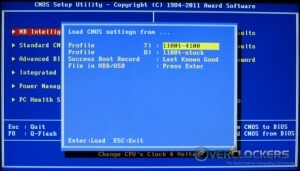 EasyTune 6 and CloudOC are Gigabyte’s methods of overclocking from inside Windows and remotely (respectively). We’ll delve into those later on too. 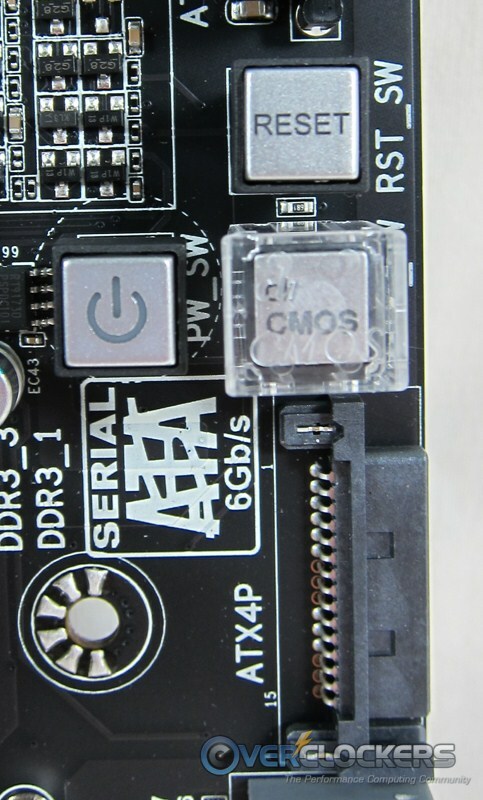 Two other items overclockers will welcome are the POST code indicator and onboard switches. The POST code indicator is nice to have (but maybe not as simple to use as ASUS’ QLED) and the onboard switches are a must-have for any overclocker, especially those that may take their systems to the extreme. 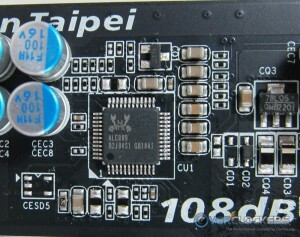 An onboard Debug LED (Embedded post code LED display) simplifies motherboard signals and indicates system status. Onboard Power, Clear CMOS and Reset buttons allow for quick and easy tweaking for power users working in an in chassis environment. On paper, this is definitely a solid board packed full of features. The UD7’s graphics ability necessitates a strong accessory bundle. To accommodate triple and quadruple GPU setups, Gigabyte includes two Crossfire bridges and a dual, triple and quad-SLI bridges. 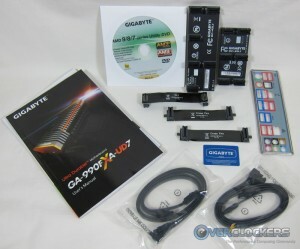 Add to the graphics accessories four SATA cables, the manual, driver DVD, and I/O backplate and you’ve got plenty of accessories to use your board to its fullest. We start off this close-up tour with the biggest factor that separates this board from its competition – a cornucopia of graphics connectivity. 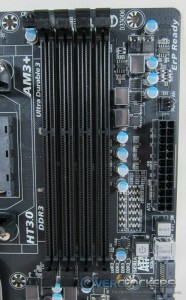 Fully six PCIe x16 slots. 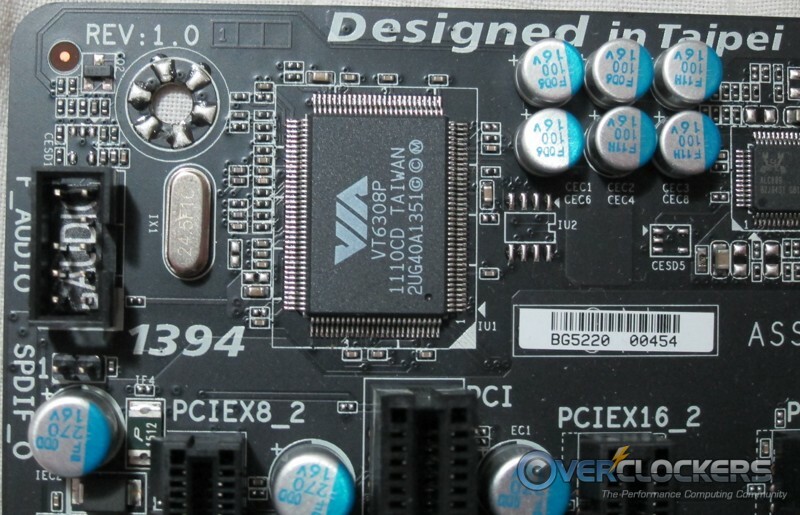 These can operate at 2 x 16x, 1 x 16x + 2 x 8x or 4 x 8x, combining to use the 32 available PCIe lanes on the 990FX northbridge. Not all of these are used for graphics of course; two operate at x4 speeds. 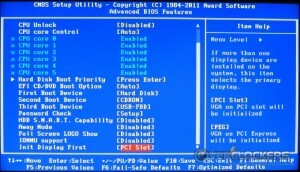 There is also a PCI slot for anybody that has a legacy card to use. 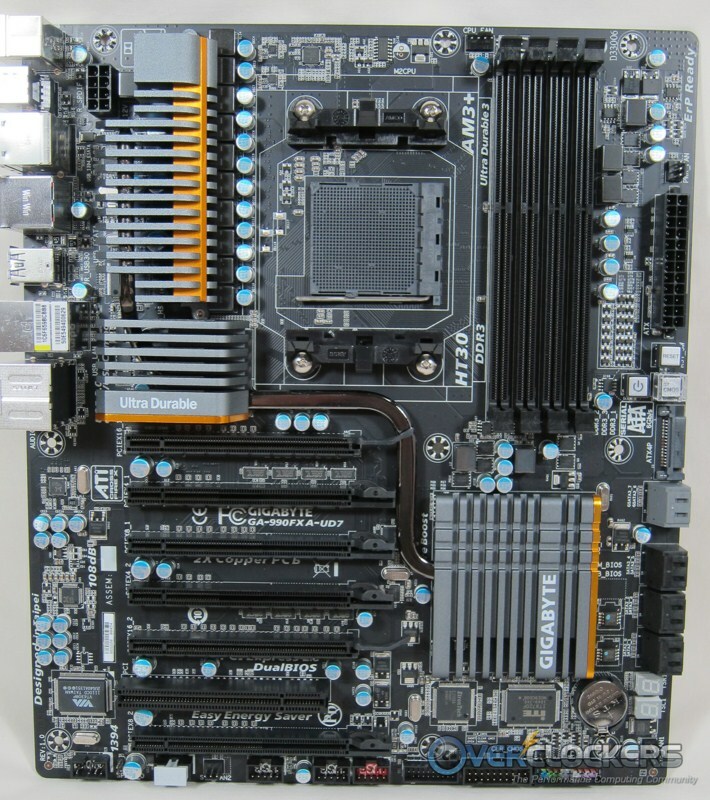 On the bottom of the board is all of the front panel connectivity, from 1394 to USB 3.0, there is everything on here. 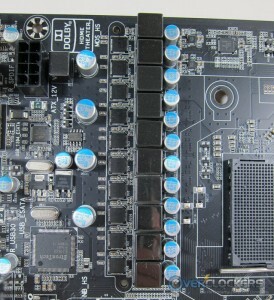 On the right side of the board is a fan header and the POST code indicator (bless you Gigabyte). For those that can figure out how to interpret a two-digit code (hint – it’s not that hard), this is an invaluable troubleshooting tool. 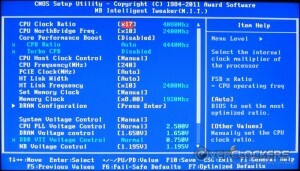 It’s not as easy to use as ASUS’ Q-LED indicators, but it’s a welcome sight for old school overclockers. Moving northeast, we have the board’s four DIMM slots, complete with their own ferrite chokes, solid caps, and driver MOSFETs; just like the board’s power section. To the DIMM slots’ bottom right are the onboard power, reset, and clear CMOS buttons. 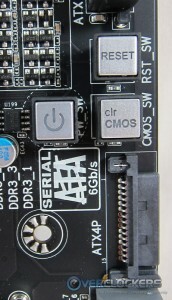 In a smart design move, they include a cover that prevents accidental pressing of the clear CMOS button. 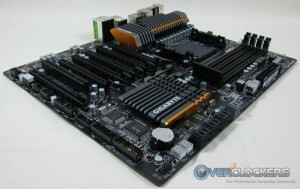 Just below the buttons is Gigabyte’s take on extra board power. 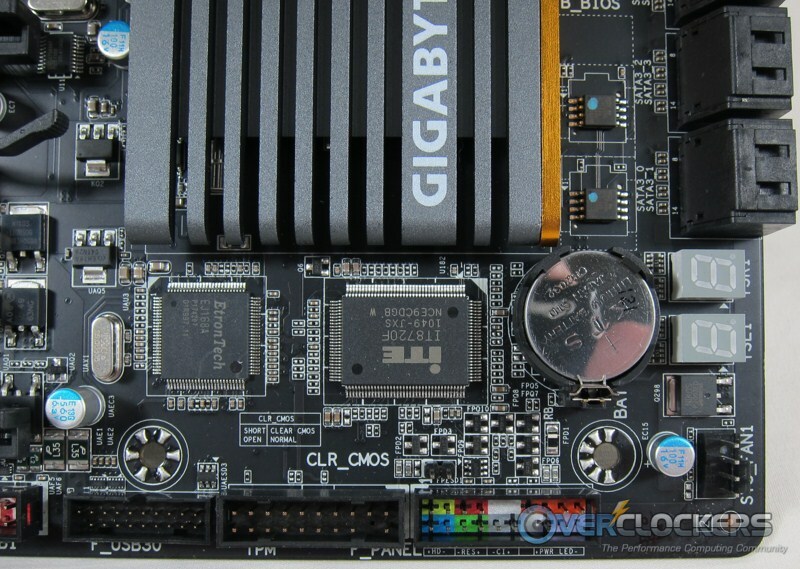 While some boards use a MOLEX connector for extra juice, Gigabyte chooses to use an SATA power connector for some extra power. It’s an interesting design choice, which would seem to lend itself to better looking wire management. Moving a bit closer, we have several chips to cover. On the left, we have the Reatek ethernet controller, and to its right is the audio codec (also Realtek). These are pretty industry-standard. Nothing to call home nor complain about. 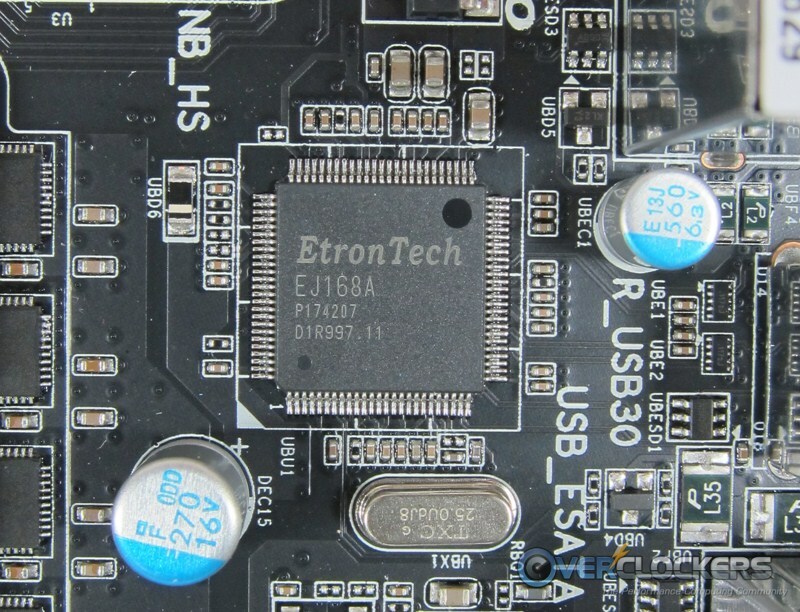 USB 3.0 comes to the UD7 via an EtronTech controller chip. Spare internal and external SATA 6Gb/s is brought to you by two Marvell chips. Internal storage connections are all SATA 6Gb/s. 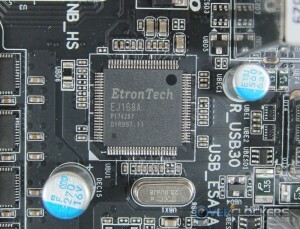 Six of the eight connectors are controlled by the SB950. The other two are controlled by one of the Marvel controllers. 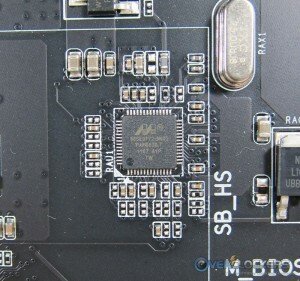 Last, but not least, you can see all of the rear I/O connectivity, of which there is plenty. There are ten USB ports (2x USB 3.0, 7x USB 2.0, 1x eSATA/USB combo), a firewire and ethernet port, plus the requisite audio outputs. To look under the hood, of course we need to remove the heatsinks. Like most new high-end boards, Gigabyte has secured theirs with screws (thankfully that has become a trend). 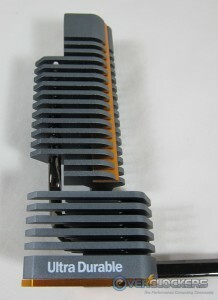 The MOSFET and northbridge heatsinks are combined into one piece. 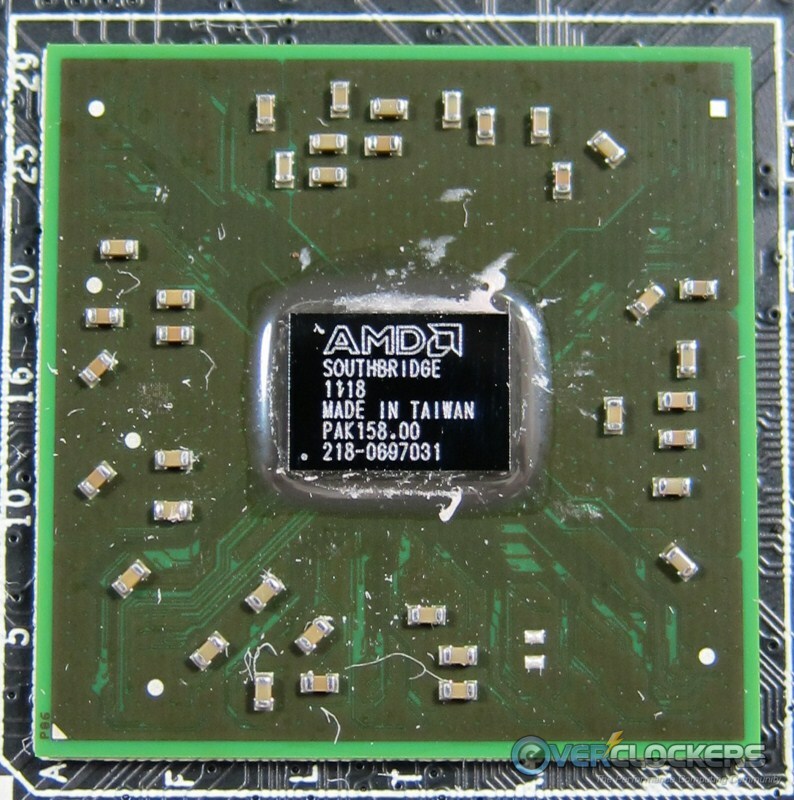 The southbridge heatsink is connected to those by a heatpipe. But wait, there’s more! 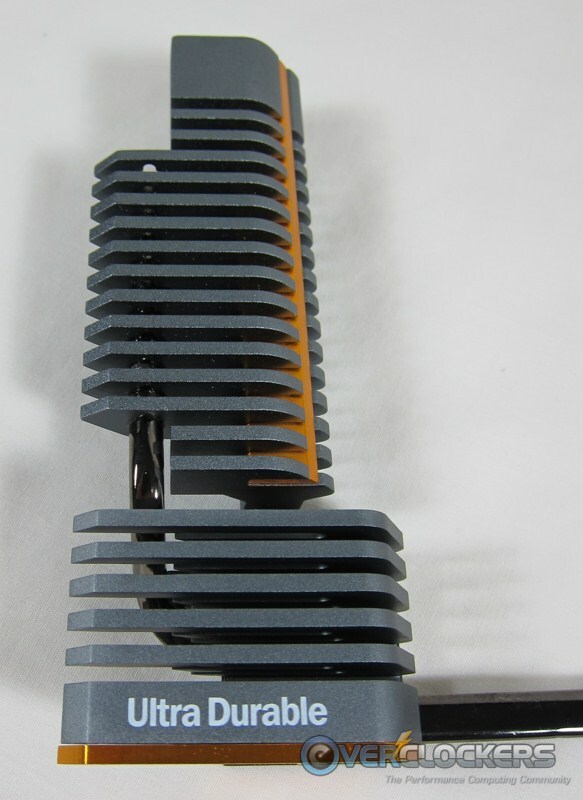 The Northbridge heatsink has another heatpipe that extends up to the fins above the MOSFETs. All in all, this is a very well designed cooling solution. 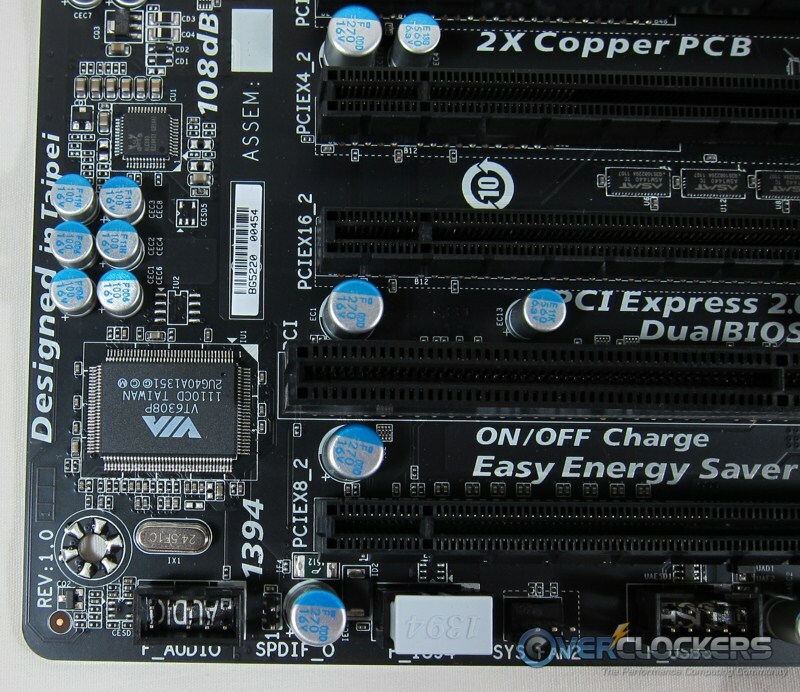 Now that we have a naked motherboard, let’s first look at the power section. All solid capacitors, ferrite chokes, and Gigabyte’s “Driver MOSFETs” make up this stout 8+2 phase power section. 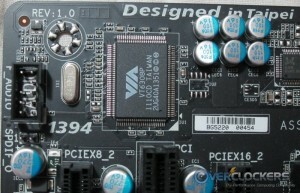 The capability is there to have very stable power, but unfortunately we’ve reached this board’s major pitfall – extremely severe Vdroop (the difference between idle and loaded CPU voltage) of greater than 0.12 V, which would be okay if there were an option for LLC (Load Line Calibration) like ASUS provides, but there is no such option in the BIOS of Revison 1.0 UD7 boards. Yes, there is another revision, which has the potential to be the UD7’s saving grace. We’ll check that out below. 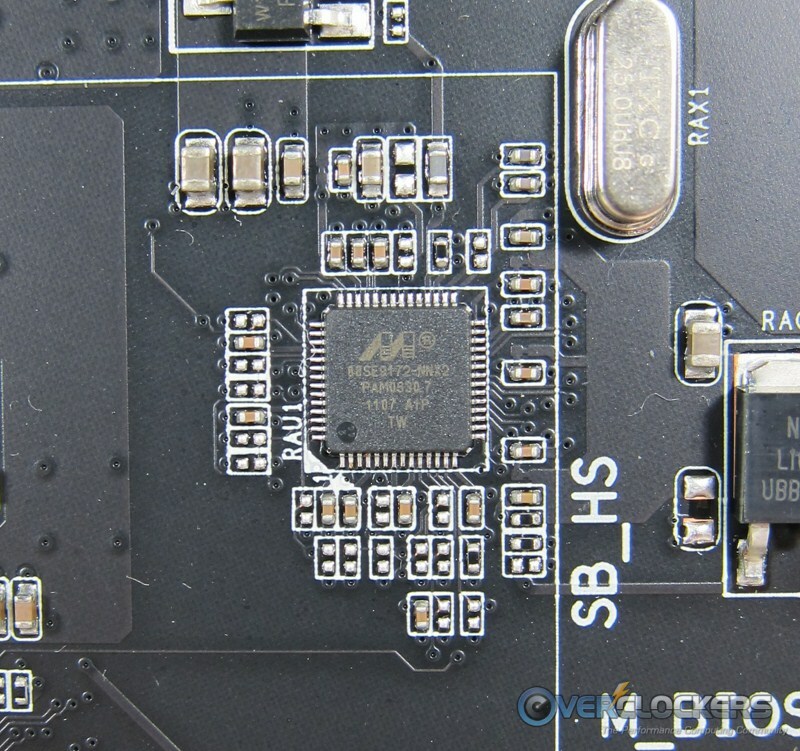 The solid power section goes mostly underutilized in revision 1.0 and one is left wondering why they equipped a board with such strength only to forget to use it. Thankfully they remembered and came out with Revision 1.1. 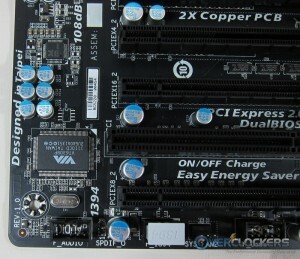 Of course the 990FXA-UD7 comes equipped with the 990FX northbridge and SB950 southbridge. So we have a mixed bag with the emperor’s clothes removed. 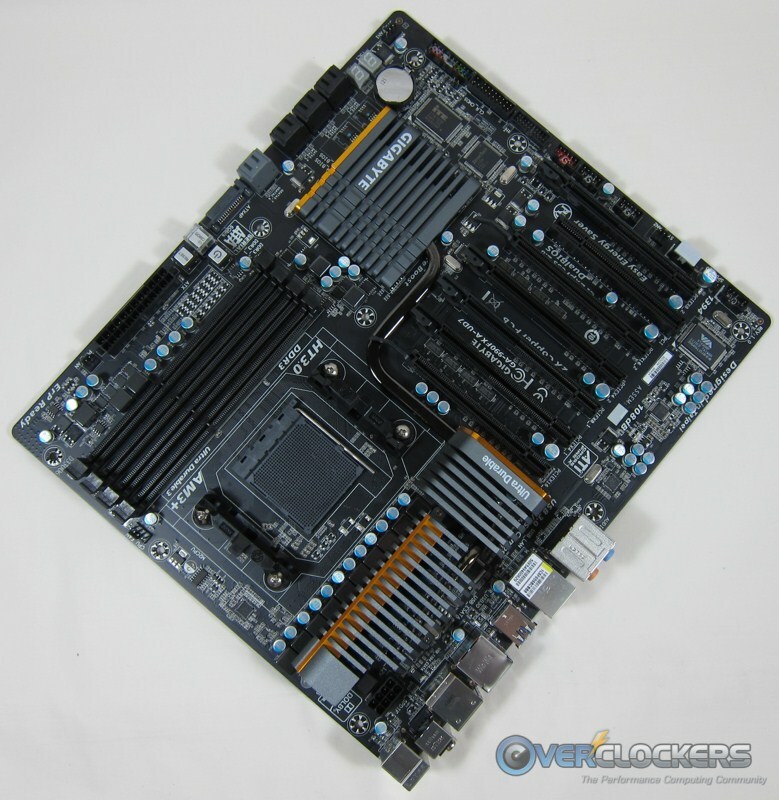 There is a very nice heatsink / heatpipe assembly to dissipate all the heat your board could ask for, a nicely engineered power section to supply plenty of power to your CPU but then there used to be a lack of ability to control the board’s power output. To give you an idea of why that was bad on Rev. 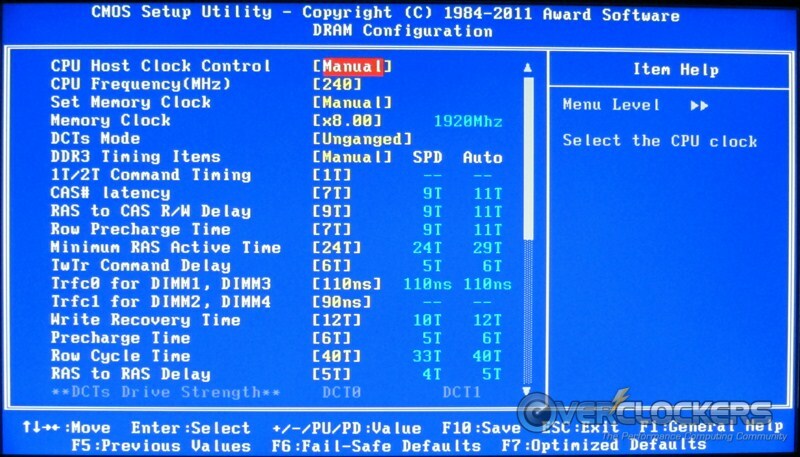 1.0, the overclock I was able to dial in with the UD7 was identical to the one on the Crosshair V Formula. Indeed, stable loaded voltage was even a couple hundredths of a volt better. Unfortunately, that victory is thrown out the window when you have to run 1.520 V through the CPU at idle in order to come out with 1.392 V loaded. While 0.128 V may not sound like a large number, it is indeed very large when you’re talking about CPU voltages. This is clearly unacceptable. Here we come to another slight beef with this board – the BIOS. 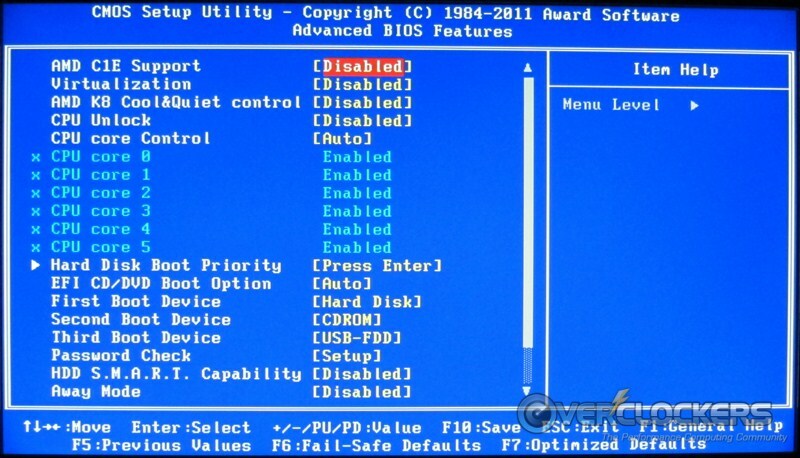 Yes, BIOS; not UEFI like most other manufacturers have moved to. 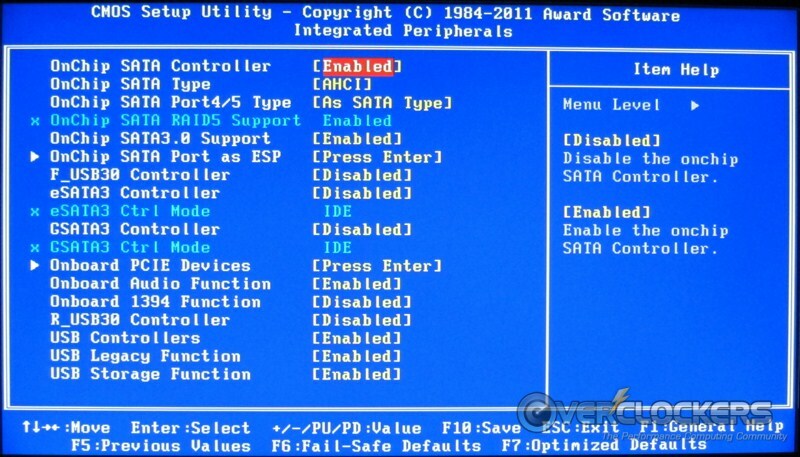 Technically, it is an EFI – they can run 2 TB boot drives, which is one benefit to the new UEFI interfaces. Unfortunately, it doesn’t have any of the user-friendliness of the new UEFIs. 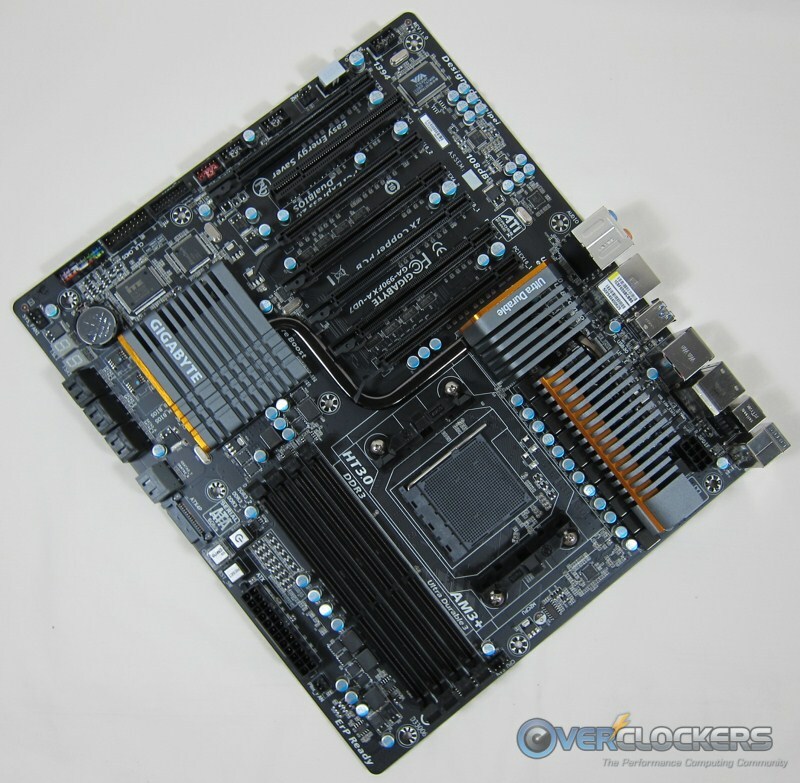 That said, it’s a fair bit snappier than ASRock’s earlier UEFIs (explored in our review of their P67 Extreme6). 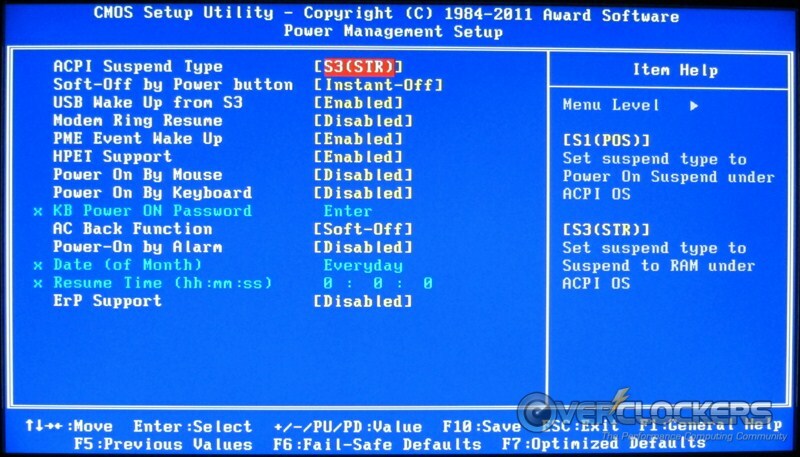 It doesn’t hold a candle to ASUS’ UEFI implementation though. At its price point, this board is competing directly with the Crosshair V Formula. 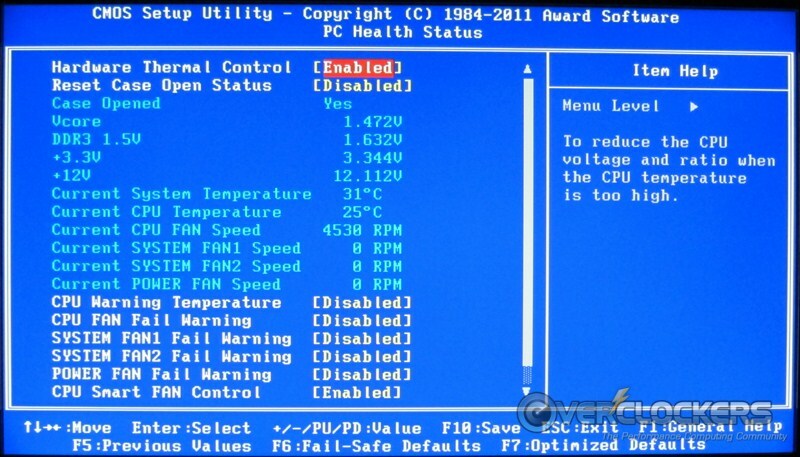 There is truly no comparison between the Crosshair V’s UEFI and this BIOS. Both have plenty of options (with the very noticeable power control deficiency of the UD7). 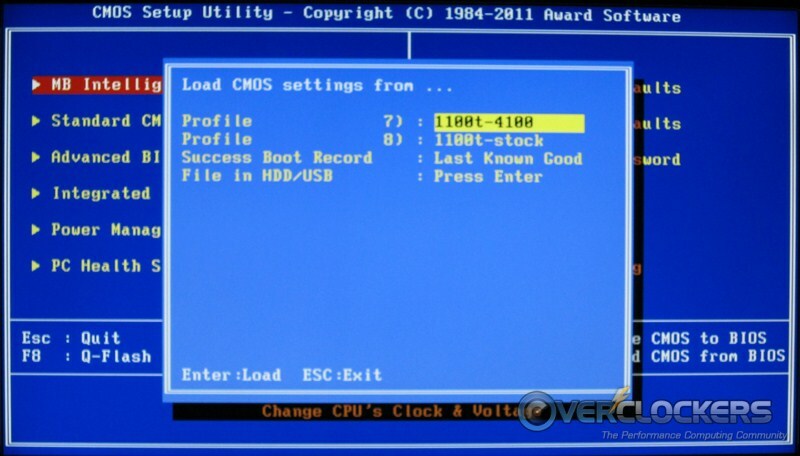 I’m personally okay with the BIOS because it’s what I know, but on the whole, a UEFI is more user-friendly and equally fast to navigate, so it wins hands down. So, what does this BIOS have in store for us? First in the menu is the MB Intelligent Tweaker (M.I.T.). 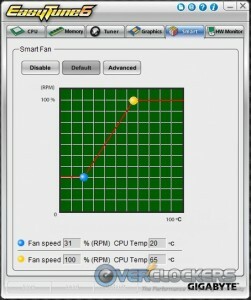 This menu gives you access to all the overclocking features on the board. There is no shortage of tweaking options – except for power control, which they have now added. 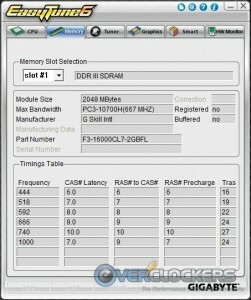 Moving on to a bright spot, the RAM menu has many options available for RAM tweakers. There are plenty of timings to keep you tweaking to your heart’s content. Nothing at all to complain about here. 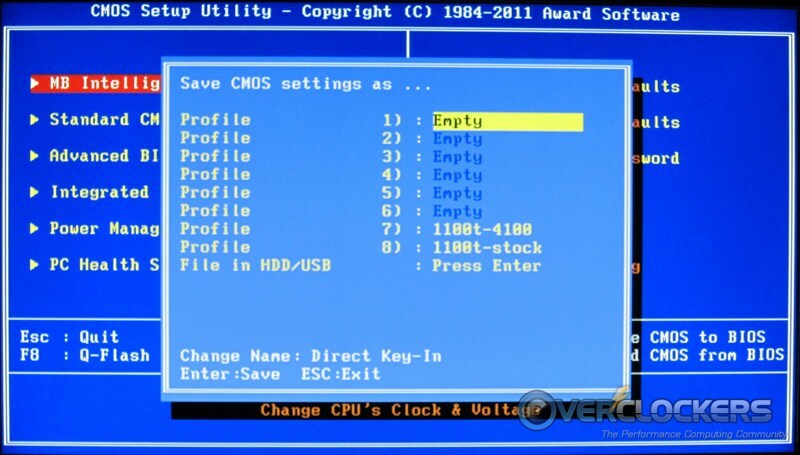 Among other items, the Advanced BIOS Options menu gives you access to the CPU power saving and core controls. 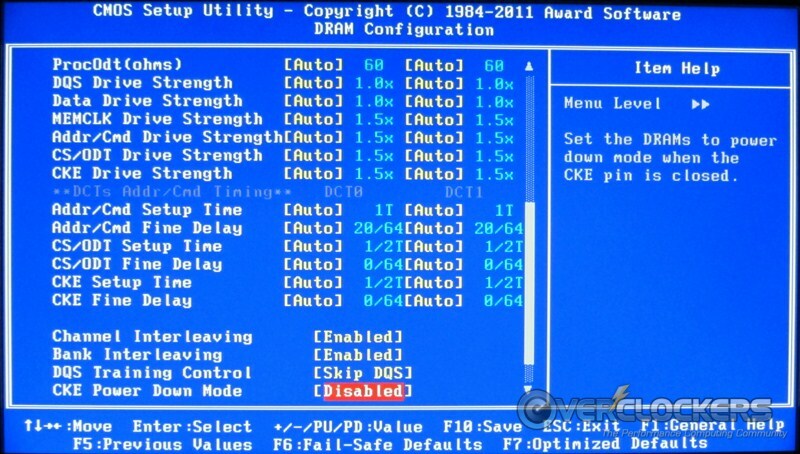 You have control to enable or disable each core individually, which is definitely what you need for hunting out your strongest core for single-threaded extreme benchmarking. 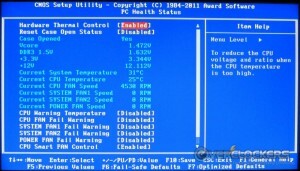 The PC Health Status menu shows various voltages, temperatures, and fan speed readings. 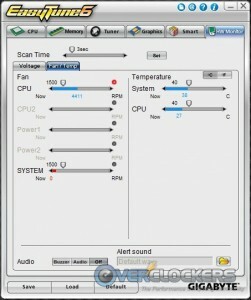 Below those are your fan warning settings and ‘Smart FAN Control’ for the CPU and one system fan. 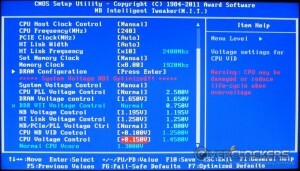 Two tools that overclockers will find very handy are Gigabyte’s Q-Flash Utility and the save/load CMOS menus. 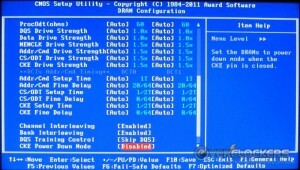 Q-Flash is a very easy utility to use. I’ve flashed two BIOSes since first starting up this board and it’s a simple, seamless process. 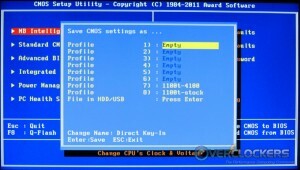 Likewise, the ability to save eight full BIOS profiles to CMOS is simple and easy to use. You just hit F11 for the ‘Save’ menu and F12 for the ‘Load’ menu. Once in there, using the profiles are very easy. Gigabyte definitely got both of these features right, and both are priceless time savers for overclockers. There definitely isn’t much left for BIOS screenshots, just three more screens showing your more pedestrian settings such as storage and onboard device settings. 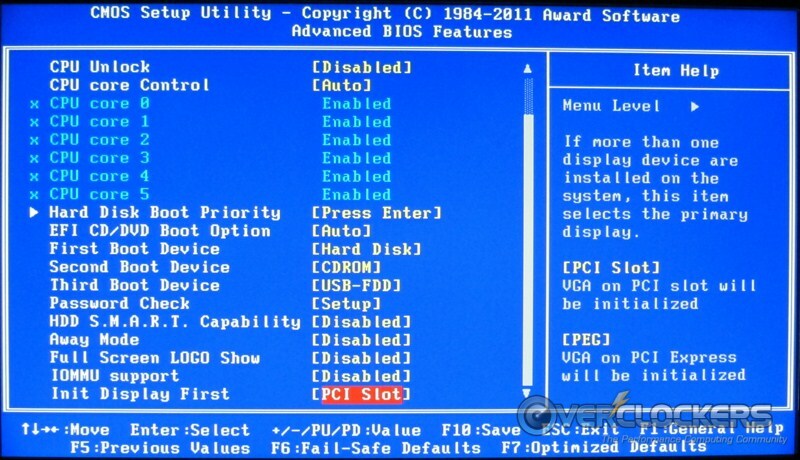 Sure, it’s not a UEFI, but as BIOSes go, it is a solid offering for sure. 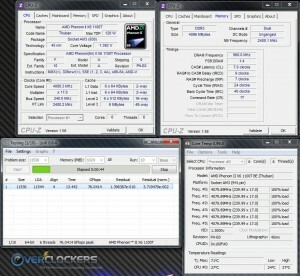 Gigabyte’s in-OS overclocking and monitoring utility is EashTune6. 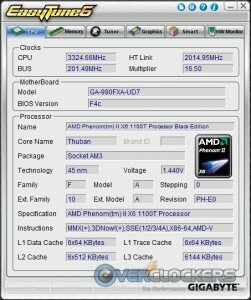 The first two tabs are information only and display information on the CPU, motherboard, and RAM. Now we get to the tweaking part of the program. There is good news and bad news. The good news is that you can tweak all of the important settings – FSB, multiplier, memory frequency, and PCIe frequency. Unfortunately, the multiplier frequency control applies to all cores, with no individual core control. Most people wouldn’t use that, but if you’re seeking out your strongest core for benchmarking and want to do it from inside the OS, you’re out of luck here. 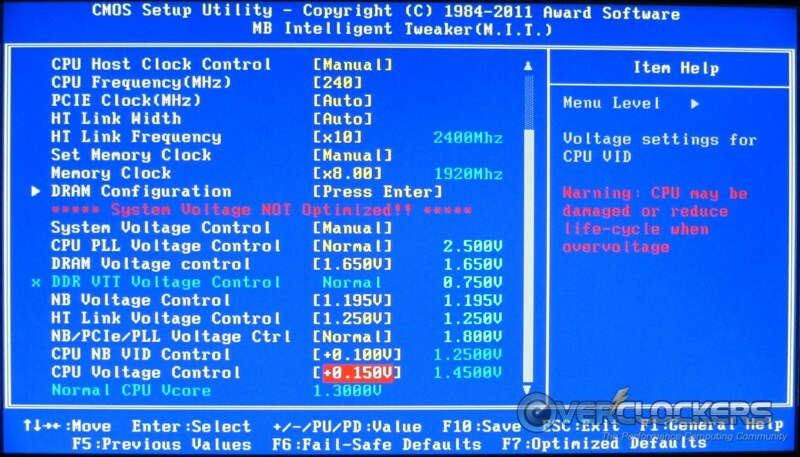 The really bad news is that Gigabyte only gives you one voltage control option. O-N-E, one. 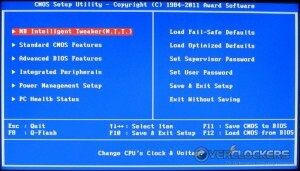 You can change the CPU Vcore and nothing else. I’m embarrassed for them really. If you want to tweak FSB, you’ve got until you get to the voltage limit you set in BIOS. Need to go farther while you’re already operating on the bleeding edge of stability? 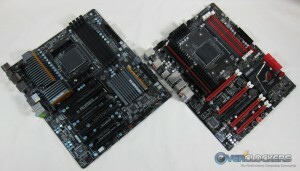 Tough, says Gigabyte, you’re going back to BIOS. What’s especially frustrating about this is that Gigabyte outfitted their G1.Sniper2, that EarthDog reviewed, with plenty of voltage options. It’s as though Gigabyte put all the effort into their Intel board, but chose to cut corners on their highest-end AMD board. You know what else they put in ET6 for the Sniper2? LLC. 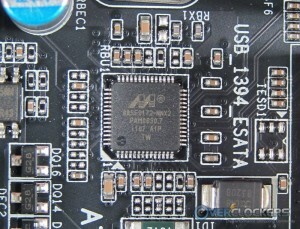 Even with the new board revision, LLC is missing from EasyTune6 for this board. It’s like their programmers just went on a break when they got to the AMD controls. 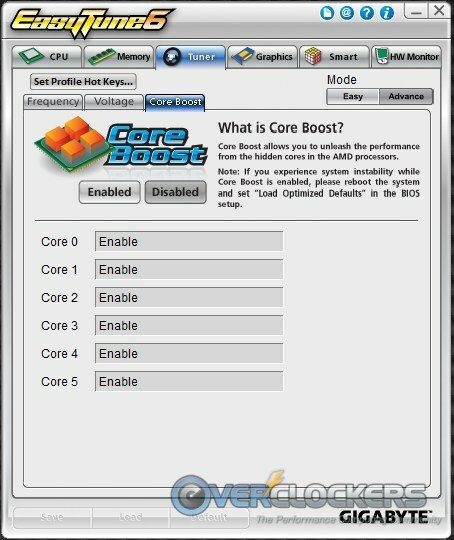 Next up in the Tuner tab is Core Boost, which lets you unlock disabled CPU cores your CPU may have. 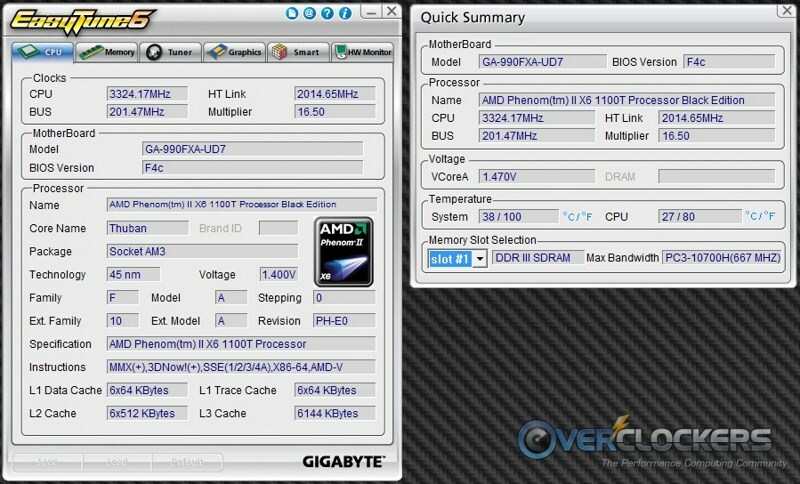 The next tab is a nice addition and allows overclocking your GPU without having to open another program. Unfortunately, there is no voltage control, but you can’t fault them for that. 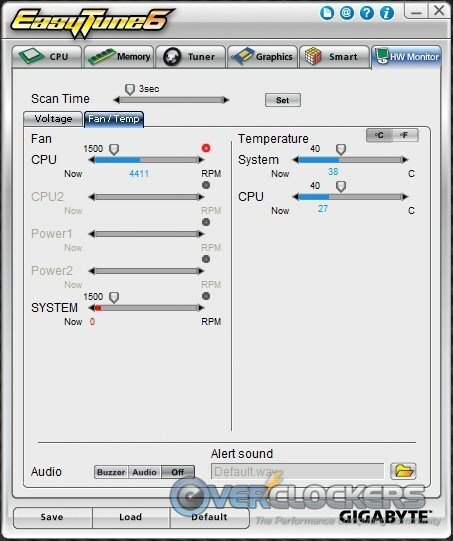 There is also a GPU temperature monitor. The next tabs are for fan control and temperature / voltage monitoring. These are both well done; nothing but positive vibes out of this implementation. So, EasyTune6 is a mixed bag. If you consider it on its own, it’s not a poor program at all except for the complete lack of other voltage controls. However, considering it against the competition, EasyTune6 isn’t the best by any stretch. While this is light and simple to use, it doesn’t offer near the experience ASUS’ AISuite does. AISuite’s TurboV EVO also offers plenty of voltage control and the ability to adjust multipliers on all cores individually. Long story short – AISuite puts this program to shame. Gigabyte’s saving grace may be their answer to ASUS’ RoG Connect – Gigabyte’s Cloud OC. Unfortunately, I could not get this to work from the web browser interface (likely an issue with my router I couldn’t find a solution to). A bluetooth adapter isn’t included with the board and my poor phone isn’t smart enough use with one anyway. So there is potential there – check out this video – but it’s unrealized in this case. ASUS wins again because RoG Connect just uses a USB cable and is completely trouble-free. 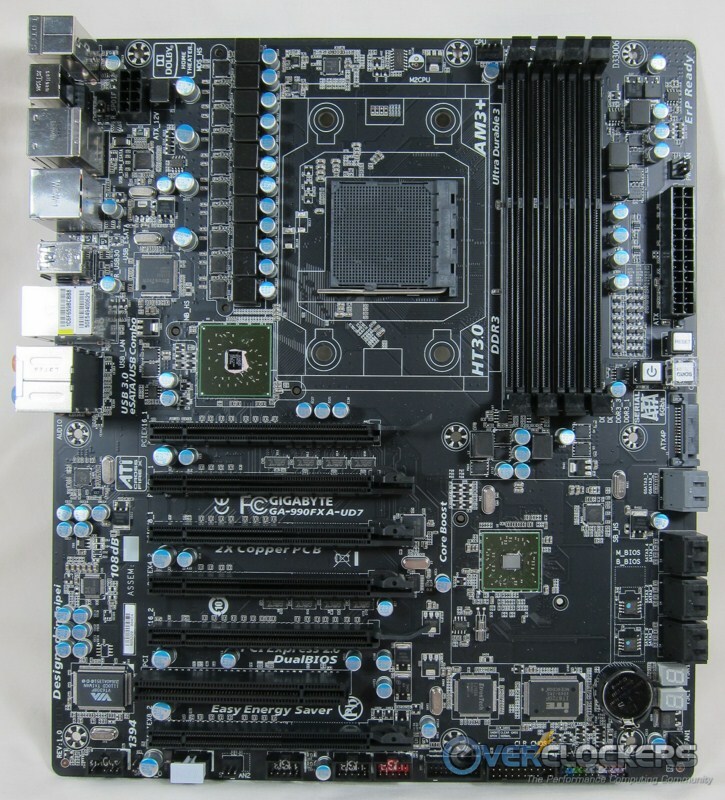 The test systems in this review were identical in every way except for the motherboard. 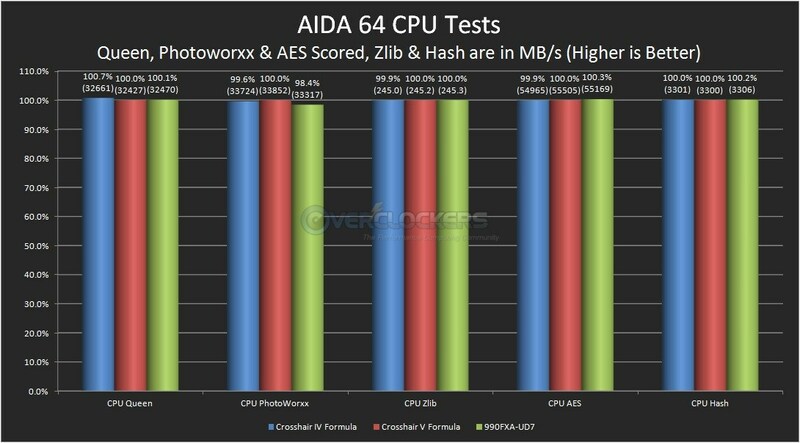 The Crosshair IV Formula results are only reflected in the AIDA64 results. 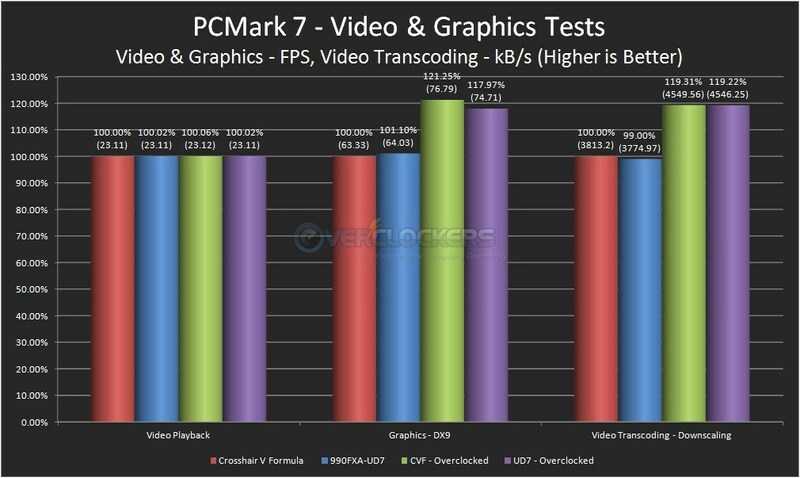 The rest of the benchmark graphs show stock and overclocked results from the Crosshair V Formula and the 990FXA-UD7. I said it before and will say it again – I really like the look of this board. Once again, we have our competitors lined up next to each other. The UD7 is certainly larger and those in space-constrained cases may want to take note of the measurements mentioned earlier just to make sure you won’t run into any problems. That said, it will fit in most cases without issue. 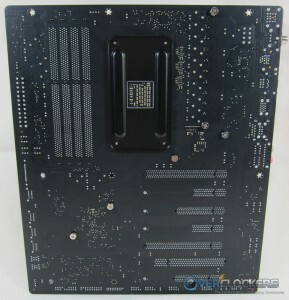 It’s just a slightly-larger-than-ATX form factor, using the same screw holes. 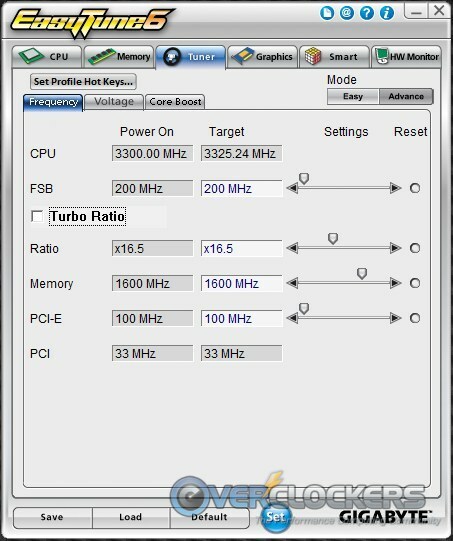 Considering this is the same 1100T, overclocking results are much the same as with the Crosshair V Formula. It managed the same 4.08 GHz at 240 FSB and 17x multiplier. 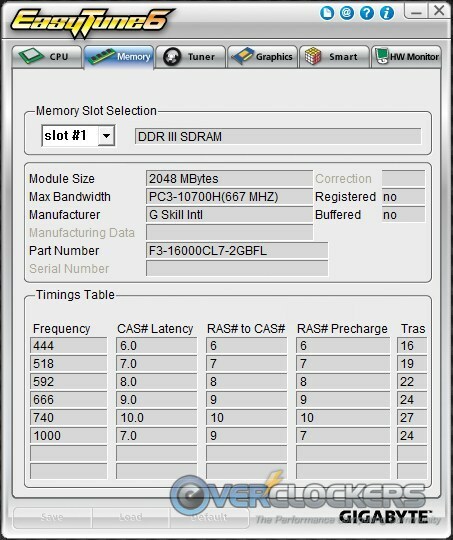 RAM clocks didn’t change. The main frequency difference was that the Crosshair V has a 0.8 MHz FSB overshoot, where the UD7 is dead on 240.0 MHz. 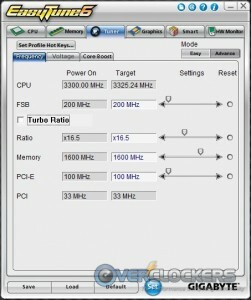 Thus, the Crosshair V clocked in at 4093 MHz and the UD7 at precisely 4080 MHz. The very unfortunate Vdroop issue rears its ugly head here though. While the UD7 managed to do a little better on loaded voltage (by about 0.04 V – a solid improvement), to get there, you had to run an atrocious 1.52 V through the CPU at idle. In the screenshot on the left you can see loaded voltage, and on the right you can see the run completed at that setting, but you can also note the crazy high idle Vcore. As you can see and as previously mentioned, that is an atrocious Vdroop level. For the obvious reason I didn’t want to push Vcore into completely unreasonable levels, I didn’t try for a max CPUz validation. At 1.52 V idle for 24/7 clocks, going much farther than that just wasn’t in the cards. Gigabyte would say (correctly) that the UD7 was designed to AMD’s specifications for Vdroop. I would say phooey. Any overclocker has the expectation that a motherboard at this level will be able to hold the voltage they want, where they want it. 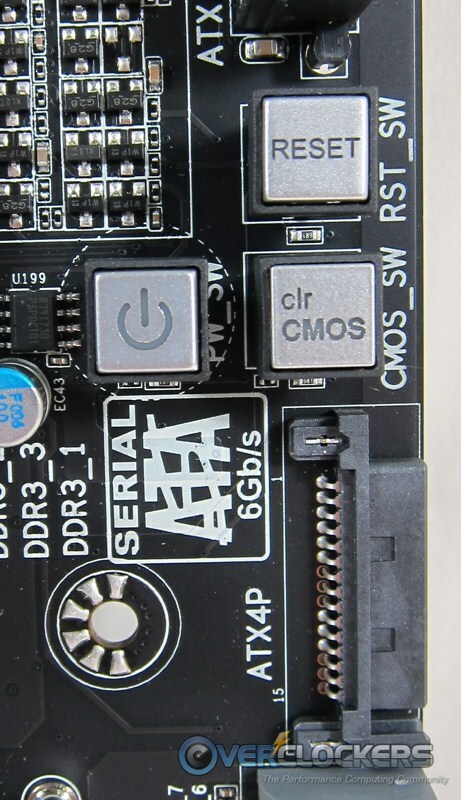 ASUS had no problem doing this on the first go, so design-to-spec is no excuse. Considering the lessening of Vcore at the same clocks, the UD7 has real potential to be a great clocker, but it will only be able to do so if they can introduce some sort of voltage control / LLC to mitigate that Vdroop (again, which they have now done, to good effect I might add). Like the Crosshair IV vs. Crosshair V comparison, I expected and received very little difference in scores across the board. It’s the same chipset with the same components after all. 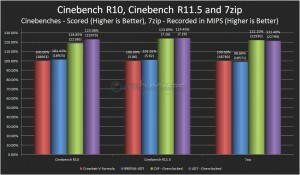 So you’ll see a lot of very similar numbers as we go through the benchmarking comparison. Starting off we’ll run through the AIDA suite of CPU, FPU, and memory tests. 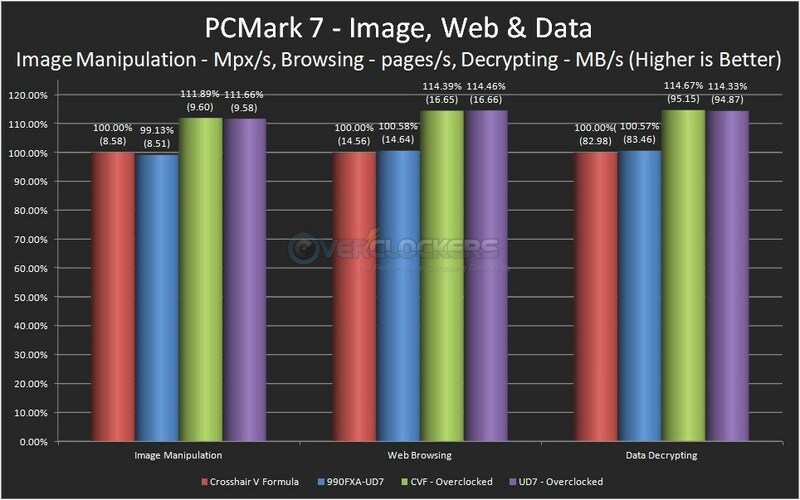 With CPU and FPU tests, the maximum deviation all around was 1.5%. Every bench was just that close. Most actually went to the UD7, but where there was greater than 0.3% variation, it was where the Crosshair V jumped over a percent. Now for the memory benchmarks. 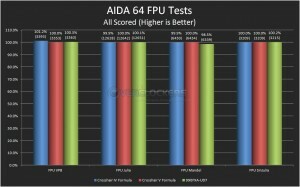 If there is to be a winner on average here, it is the UD7, which bested both ASUS offerings when these results are taken as a group. Again, keep in mind we’re talking numbers completely imperceptible to any user on a daily basis. Rendering and compression are two of the more real-world tests we can run. 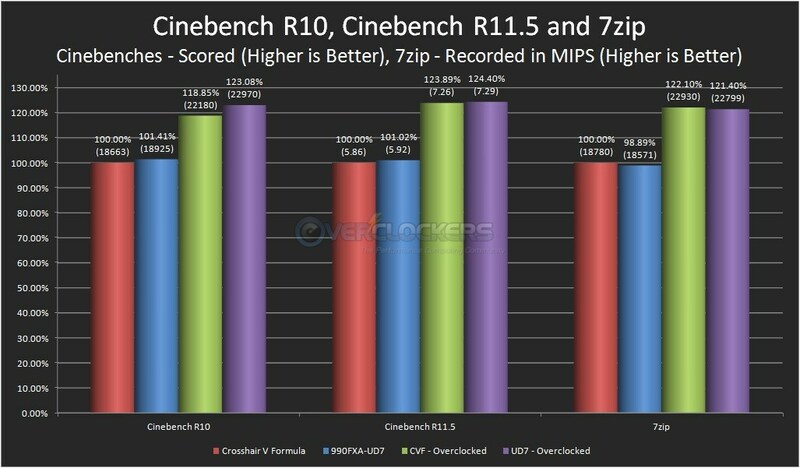 For these we use Cinebench R10, Cinebench R11.5 and 7zip. The UD7 absolutely takes the cake rendering. 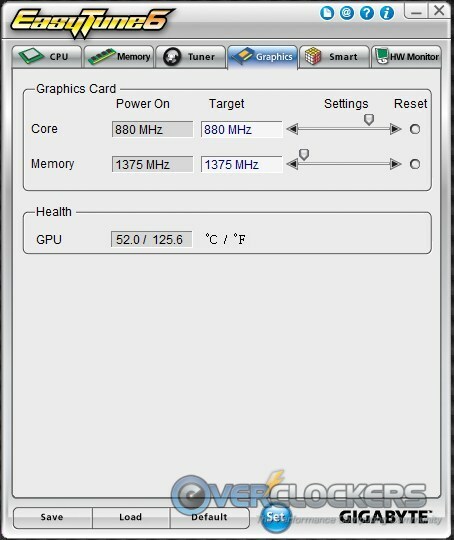 It has beat out the Crosshair V at stock and continued to stay above the ASUS board overclocked even with the 13 MHz clock loss. Compression saw the pendulum swing the other way, with the Crosshair V winning out. 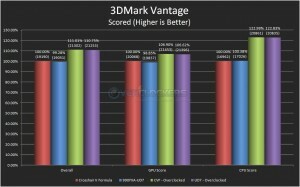 3D benchmarking performance was measured with 3DMark06, 3DMark Vantage and 3DMark11. I’ll just let you run through the graphs and we’ll talk about them as a whole. 3Dmark11 is the only one of the three where the UD7 comes out on top – and at that, barely so. Vantage and especially 06 both went to the Crosshair V.
Now, for the real-world results, how did they compare when gaming? To test that, we compared Stalker: Call of Pripyat (all four different tests) and Aliens vs. 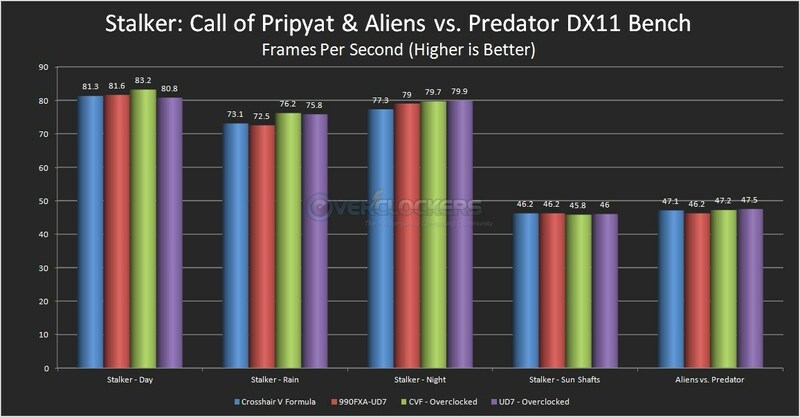 Predator DirectX 11 bench. Both of them were run with maximum settings at 1080p. I think the best that can be said here is that they’ll trade blows depending on the game and the way the wind is blowing. 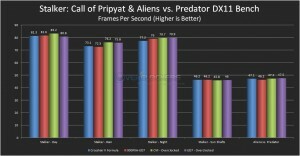 No true difference will be discernible when gaming in DirectX 11. The only significant difference you might see is DirectX 9 gaming, evidenced by the 3DMark06 results – but even then, you’re looking at an average difference of only 2.77%, something you’ll never notice. 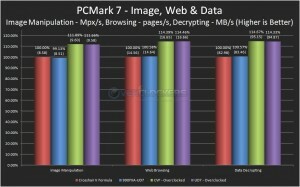 For looking at overall system performance we’ll check out PCMark7 results through all its sub-tests. To begin with, we’ll see the overall score and the storage subtests. 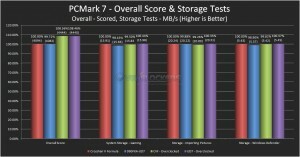 The SSD used in this review was identical to the one used in the Crosshair V review. The UD7 takes a (small) hit here when it comes to the storage tests, and even the overall test at stock. 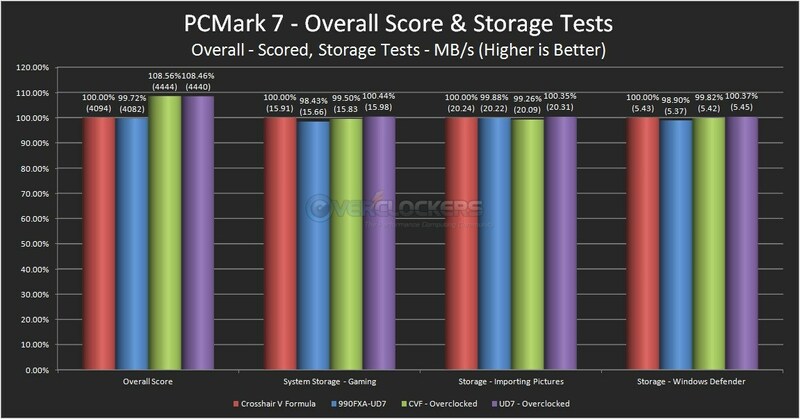 Overclocked, the UD7 just lost the overall score (by a mere 0.10%) but actually gained ground in the storage tests. Video and graphics were neck-and-neck. Depending on the test, the UD7 or the Crosshair V could have come out on top. The only decent difference was overclocked DirectX 9 test, which is actually a 3DMark06 subtest run in a window, so it stands to reason there will be a slight difference there, but even so it’s a very small difference. Web and data show virtually identical results across the board. Nothing to see here folks. Long PCMark7 story short, even though the bench was run twice (which actually means six times because it runs through three iterations every time you run it), with a maximum 1.57% deviation overall, don’t put too much credence into who took what bench here. Last, but not least – 2D benchmarking with SuperPi and WPrime. SuperPi was close, very very close. Maximum deviation was well under 1%. WPrime 1024M was just about as close, with a slight tip of the hat to the UD7 when overclocked. 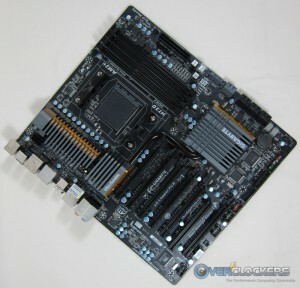 WPrime 32M was the kicker, showing stronger performance from the UD7 at both stock and overclocked. As this review was written before Bulldozer arrived, all of the tests above were performed on a Thuban. 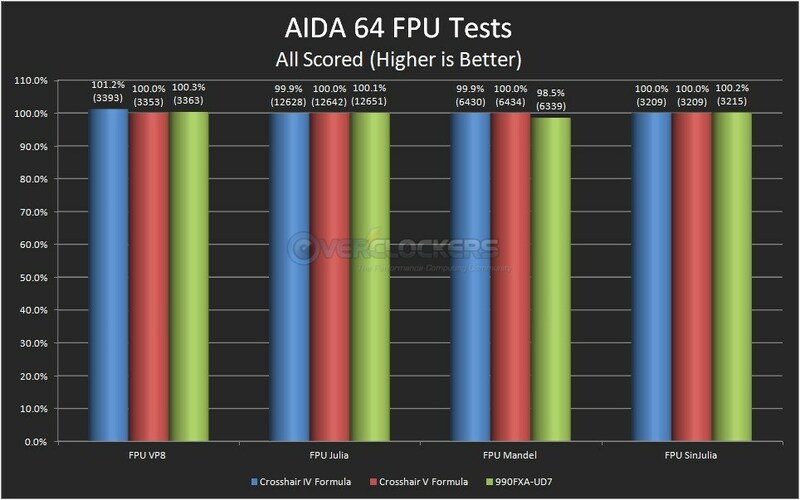 I wasn’t going to re-test with Bulldozer, but there was a rumor that kept popping up from the nether-regions of the internet that the Crosshair V Formula tested in reviewers’ Bulldozer reviews either had something wrong with it or had a buggy UEFI hindering Bulldozer’s performance. 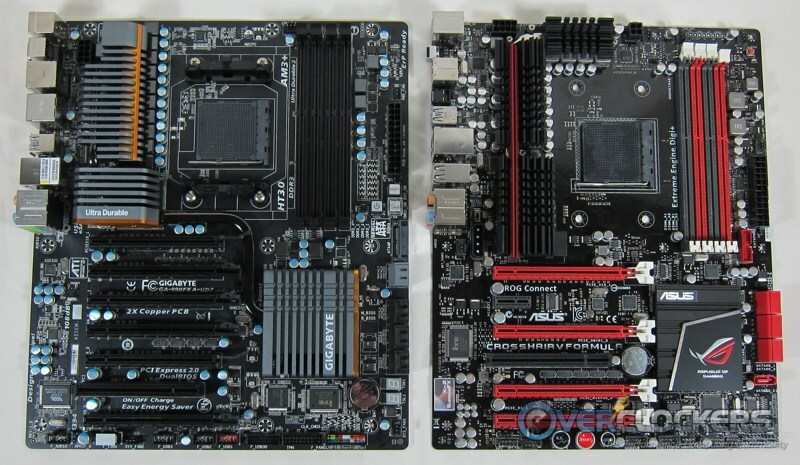 Thus, it seemed prudent to pop the FX-8150 in this board to run a quick comparison. In the giant graph below are all of the 2D benchmarks we ran in the Bulldozer review. They range from synthetic single-core SuperPi to the real world rendering and compression benchmarks. Clicking this graph will open it in a new window because it is way to big for a lightbox. As you can see, the UD7 trades blows with the Formula just like it did with the Thuban. It’s safe to say both boards will perform equally well clock-for-clock. 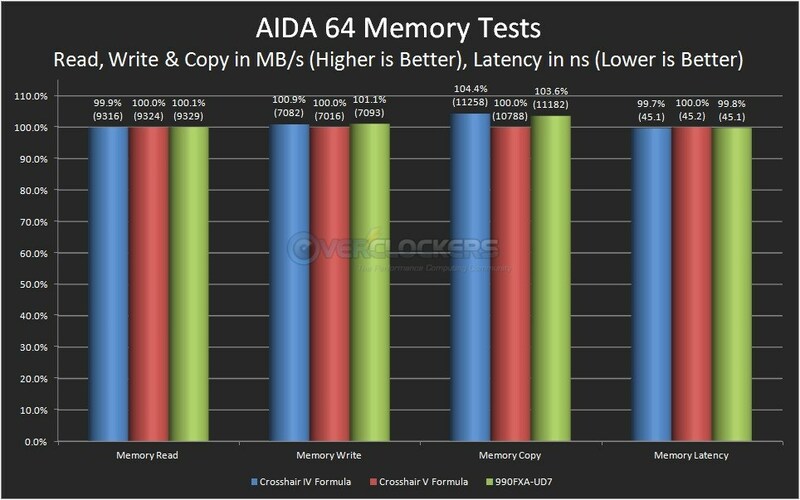 Features, software and personal preference will be the difference between the Crosshair V Formula and the 990FXA-UD7, not benchmark performance. This is what should be a minor note. There is a glitch in the current beta (G2 for those that have it) where our FX-8150 would throttle itself. It doesn’t throttle voltage, but rather clocks. 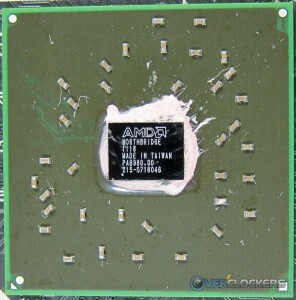 For instance, the 24/7 overclock for this chip was 4.75 GHz in its review. The UD7 took it there easily and all seemed fine. Unfortunately, when you use any multiplier greater than 16.5x, when a load is placed on the CPU, for some inexplicable reason it throttled back to whatever FSB was set x 16.5x. The overclock was previously 250 x 19 for 4.75 GHz. 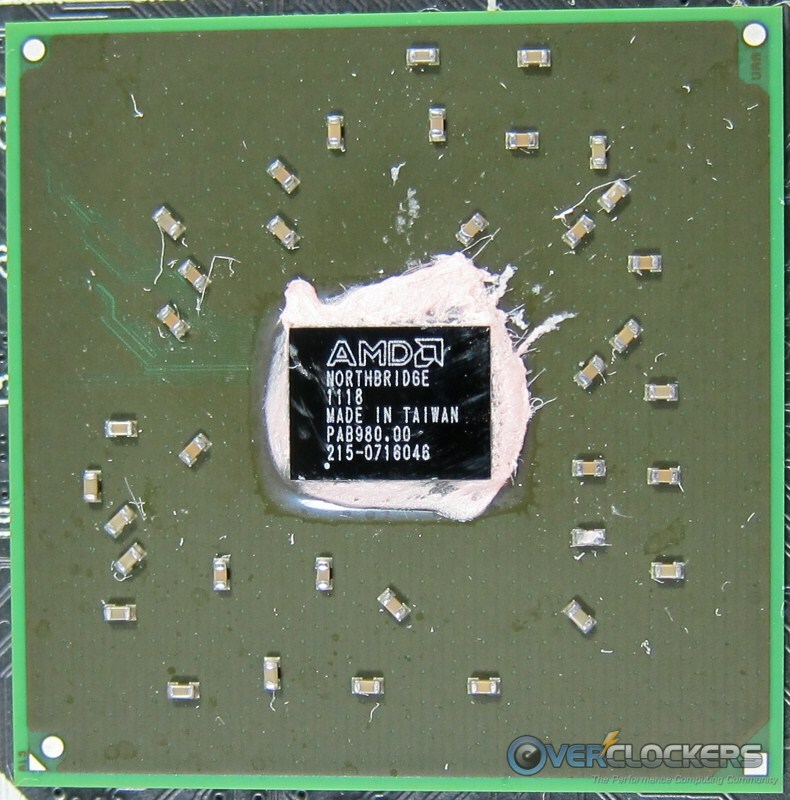 When a load was applied using Prime95 (and LinX), the frequency would throttle back to 4.125 GHz (250 x 16.5). The solution to this was simple – set the multiplier to 16.5x. 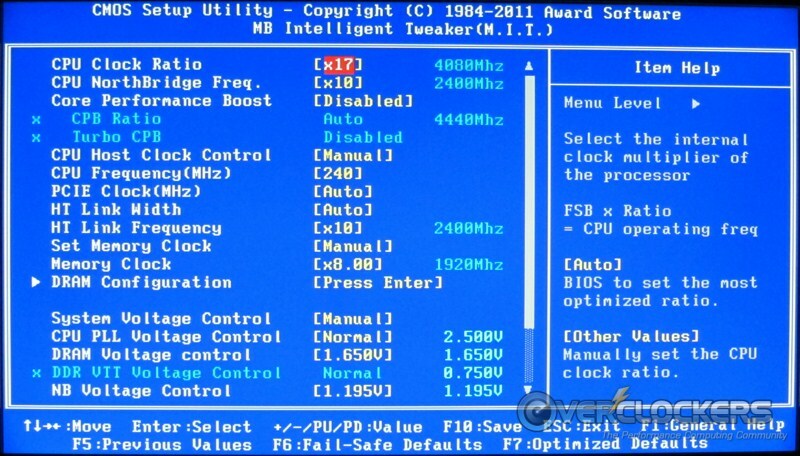 To obtain the same overclock, that meant using 288 FSB x 16.5. That’s little concern for this board and it went there easily, maintaining the same ambient 24/7 overclock as the Crosshair V before it. It does somewhat negate the usefulness of all FX chips having unlocked multipliers though. I fully anticipate Gigabyte will address this with a future BIOS revision. This one isn’t even a public beta, so glitches are to be expected. Just consider this a minor footnote for your information. If they do not fix it, then it’s a large are of concern. Remember that Vdroop thing I was talking about? The huge issue that needed to be addressed? Well, it has thankfully been addressed. 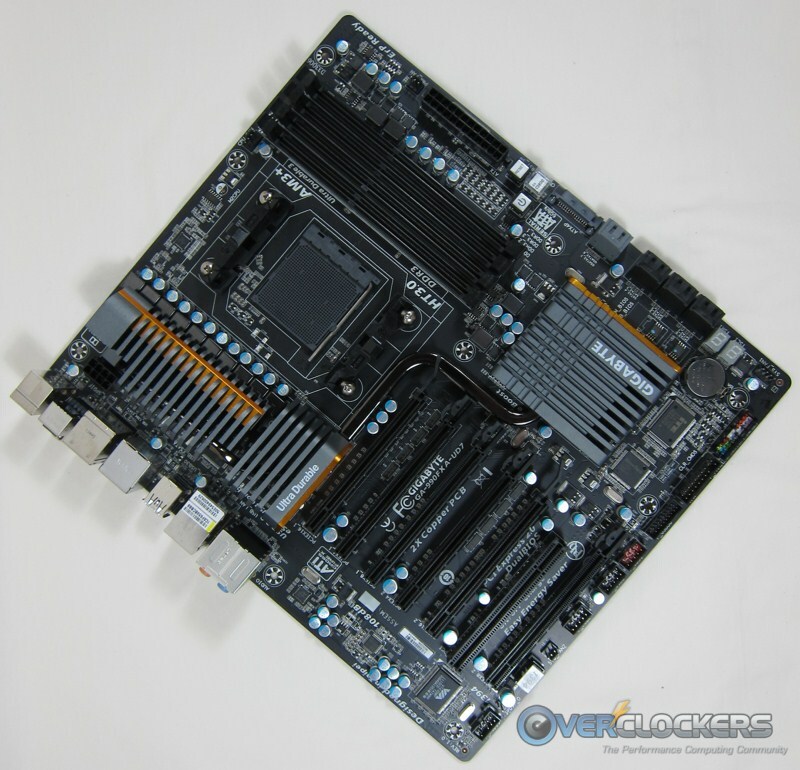 Gigabyte was unable to do much with the revision 1.0 boards other than to supply instructions for a hard-mod. Unfortunately, the hard-mod involves removing a 0 Ω resistor and installing a 100 Ω resistor. Sounds easy, right? Not when you’re talking about things even my fine-tipped soldering iron had trouble dealing with. Unfortunately, I was unable to complete the job. I’m pretty good at soldering and am an amateur radio operator, so the soldering iron isn’t a foreign object to me. However, soldering a (relatively) large resistor to such a small location was beyond my skills. Blissfully, that was not the end of the road. 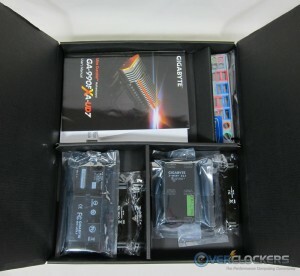 In addition to the volt mod instructions and resistors, Gigabyte sent Rev. 1.1 of their board and it does, in fact, have LLC control! You can see the components they added to the power control section to make this possible. 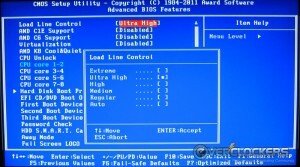 That added circuitry plus a little magic from the Gigabyte BIOS engineers introduces five-level LLC control. 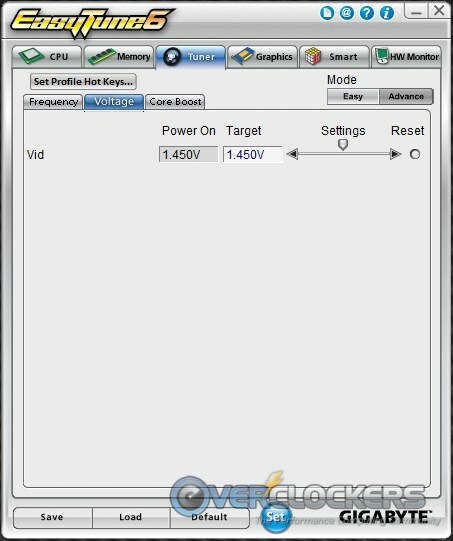 Using the “Ultra High” setting, you can keep voltage right where it is at idle for most loads. I say most loads because there are two exceptions. 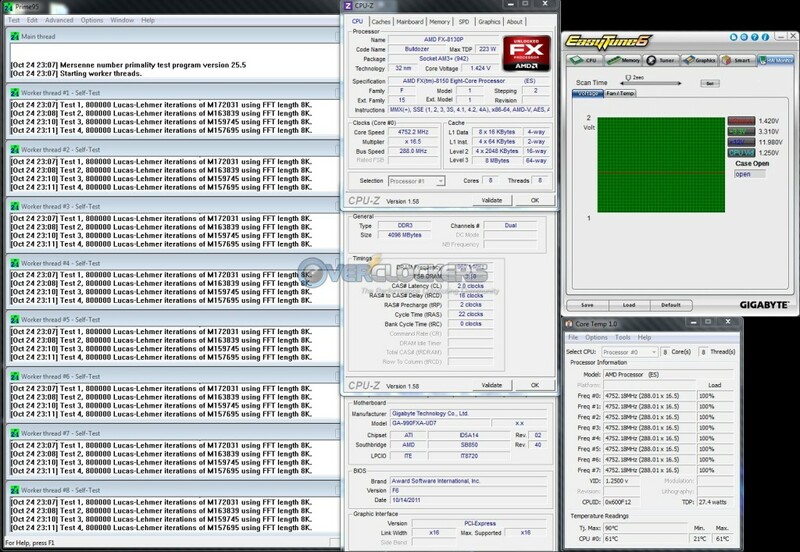 Prime95 stress testing with Small FFTs does drop it. 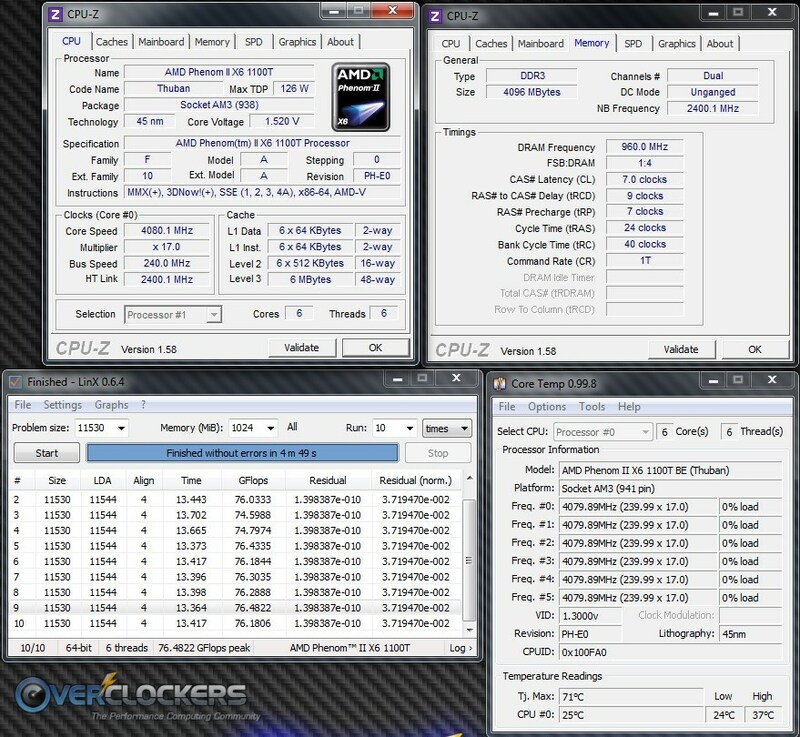 In the case of the 4.75 GHz overclock I tested with on an FX-8150, it dropped from idle Vcore of 1.440V to loaded Vcore of 1.420V. That is perfectly acceptable. Unfortunately, there is one program where even the new LLC control doesn’t help – LinX. When stress testing with LinX, you might as well not have LLC enabled. 1.440 V idle turns into 1.370 V under LinX, which, alas, doesn’t equate to a stable overclock; it crashed on the 8th iteration. You can see by the “W”s on the EasyTune graph that LLC really is trying to compensate, it’s just not strong enough to do so under the intense LinX stress load. Thankfully that is the only application tested on which that occurs. 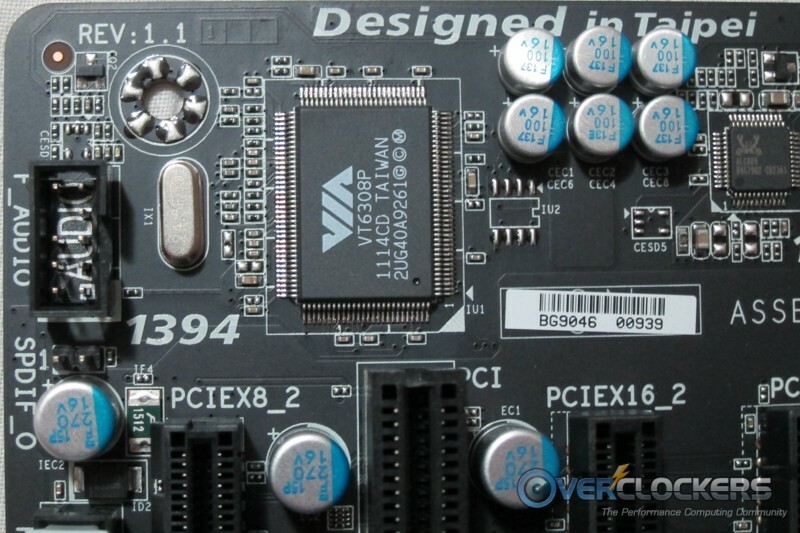 Otherwise, the lowest Vcore is a mere 0.020 V below what is set. I ran tests using WPrime 1024M, the 3DMark Vantage CPU tests, the 3DMark11 Physics & Combined tests and both Cinebench tests. Through every one of those tests, Vcore remained parked precisely at idle Vcore of 1.440 V.
LLC on the UD7 definitely isn’t as stable as the Crosshair V Formula, which didn’t move an inch, but it’s a vast leap ahead of no LLC at all. Under any normal person’s use (who uses LinX 24/7??) this LLC control is perfect. 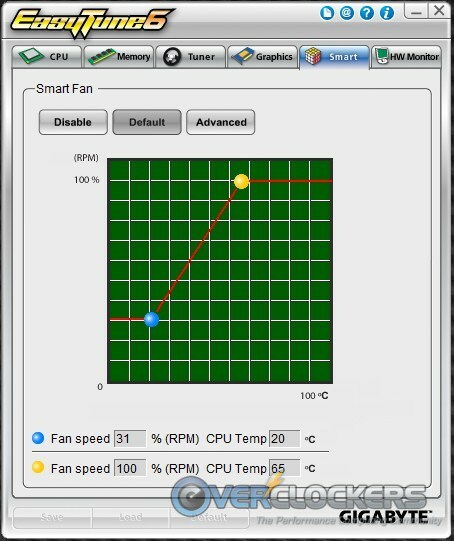 The only reason for this to be a concern is if you benchmark under extreme cooling pushing to 7+ GHz. 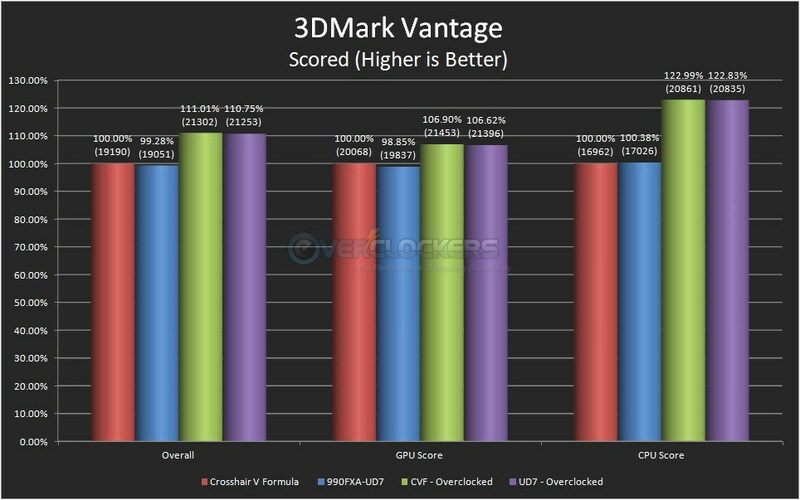 The board will do it (reference Dinos22’s 8.1 GHz validation; in that accompanying thread, he said they were running 3DMark Vantage at 7 GHz), but given the choice between the UD7 and the Crosshair V with only extreme benchmarking in mind, I’d go with the Crosshair V.
First off, the easy part – benchmarks across the board were indicative that both of these boards are 990FX / SB950 chipset boards. There’s just no reason to think one will out-do the other when benchmarking. 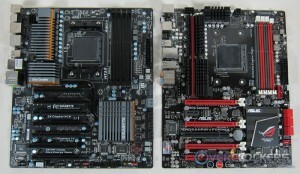 The UD7 shows that it is as capable a 990FX board as the Crosshair V.
So, that leads us to the differences. Looks? It’s personal preference of course. I really like the way the UD7 looks and if a decision between the two came down to that, the UD7 would get my vote. 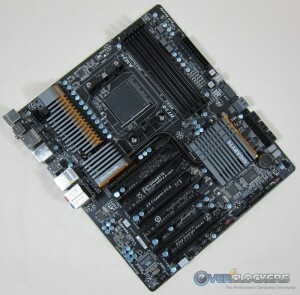 Those that want to run quad-SLI or quad-Fire will also give their nod to the UD7, primarily because it’s the only 990FX board out there with that capability. Which brings us to the down sides of the UD7. The first – and thanks to Rev. 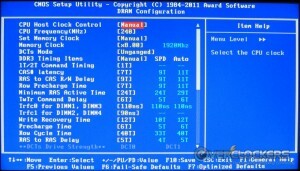 1.1, the biggest – problem is the EasyTune6 software. It pales in comparison to ASUS’ offering. What it does do, it does well. However, the complete lack of any voltage control other than Vcore is pretty sad. What’s really aggravating was mentioned before – they did put those controls on their G1.Sniper 2. 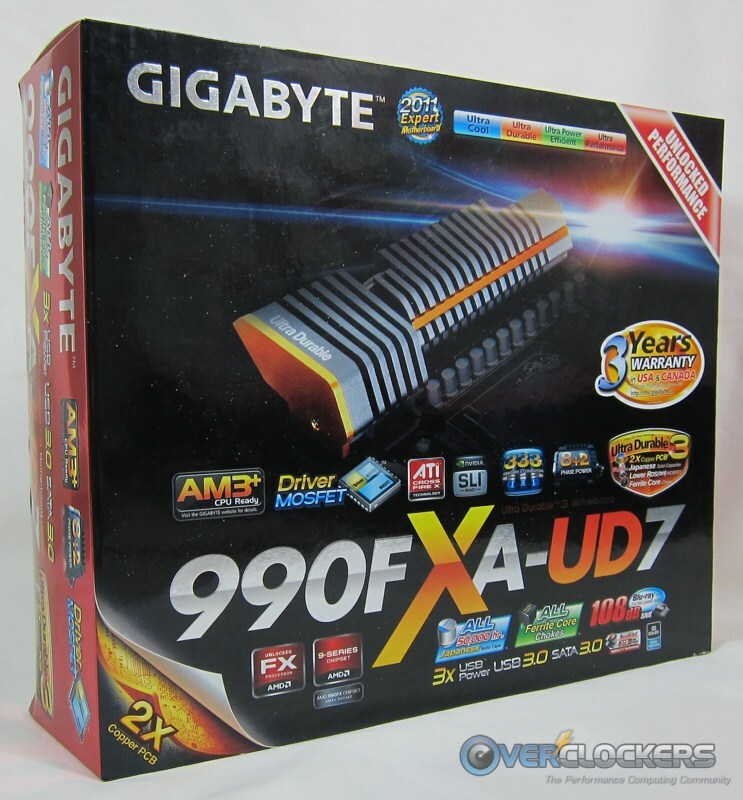 Gigabyte’s software coders appear to have gone to sleep when they got to the 990FX boards. 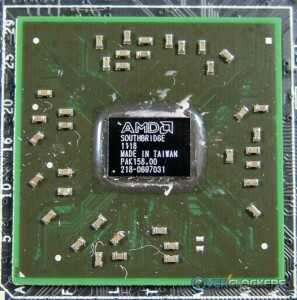 It just seems like they didn’t feel like putting forth the effort on AMD’s platform, which is unfortunate because that is this board’s biggest drawback. I actually prefer BIOS overclocking anyway, so this could be forgiven depending on who you’re talking to, but it’s still a big drawback on a flagship model like the UD7. The next qualm I have with this board was in Rev. 1.0 – the horrible Vdroop without any LLC option to fix it. Thankfully they have remedied this problem. We’re not sure exactly when that revision will be available stateside, but until they cycle all the Rev. 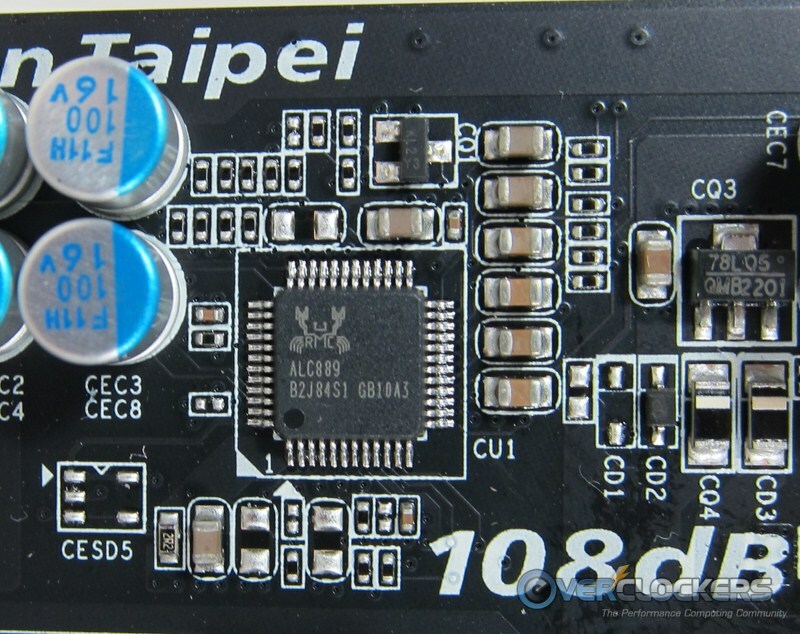 1.0 boards out of retailers’ stock, if you are interested in the UD7 buy it from somewhere you can physically see the board and ensure it is for sure Rev. 1.1. It’s not perfect. The Crosshair V’s LLC control is stronger and holds voltage even under LinX testing. That said, there is no real-world application it can’t handle with rock solid voltages, so I won’t knock it for that. Now we get to price. 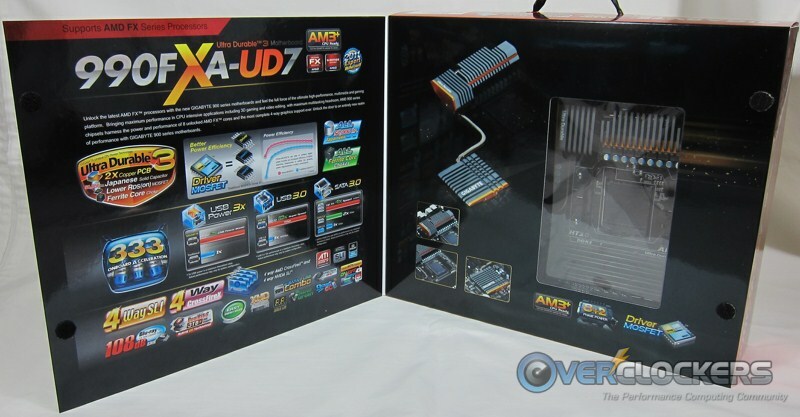 This board currently sells for $234.99 at Newegg (remember, they do not have Rev. 1.1 yet; presumably that will be the same price). 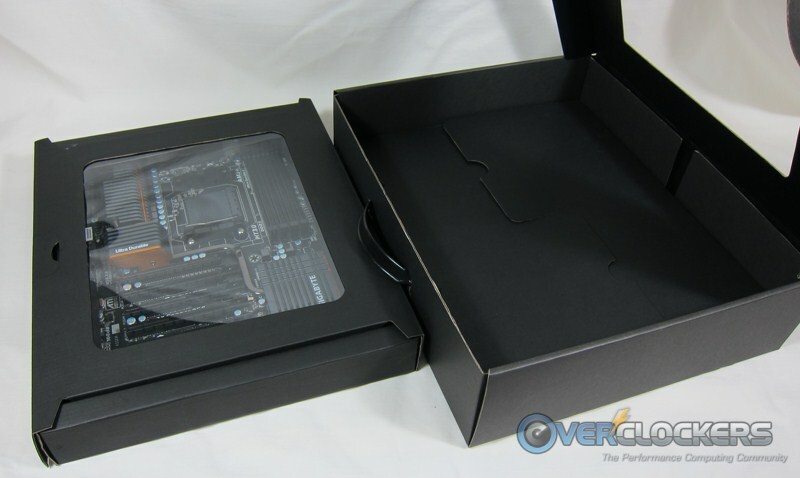 Unfortunately for Gigabyte, ASUS sells their Crosshair V Formula for $239.99. 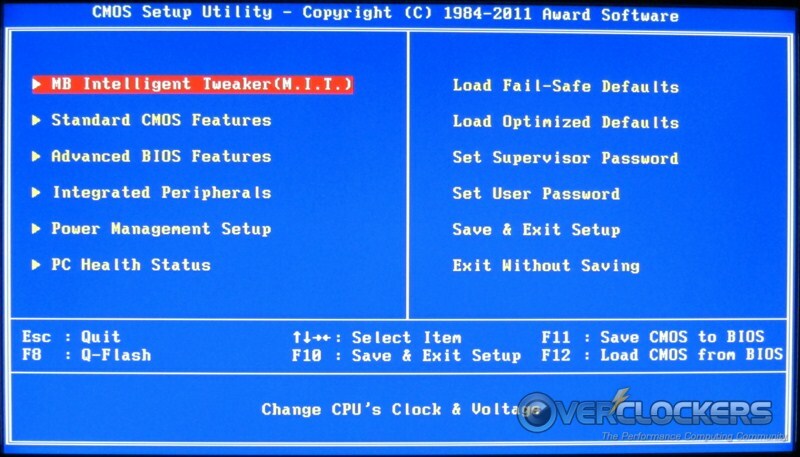 For $5, you get a vastly superior software package, LLC that doesn’t waver no matter the load (to be fair, the UD7 doesn’t droop under anything other than LinX), a UEFI that’s more user friendly, and they don’t have a clock throttling bug on current public UEFI builds. So at current prices, if pressed I’d say the board to choose between the 990FXA-UD7 and the Crosshair V Formula is the ASUS offering. Gigabyte did a lot of things right, but they didn’t do everything right. If this board sold for $200 instead of $235, maybe I’d consider them equals. 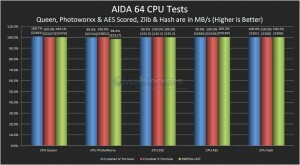 Aside from the software and the (now) minor Vdroop issue, the UD7 is a strong 990FX contender. It can run more GPUs than any other 990FX board on the market. Its benchmarks are right where they should be for its class and its overclocking ability is solid now that it has LLC. Without a doubt, the Gigabyte 990FXA-UD7 Rev. 1.1 is a solid board. 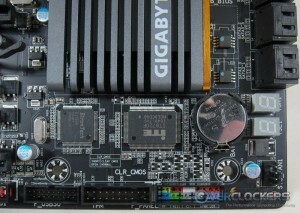 If you like the way it looks, or just like Gigabyte, no one could fault you for going this route. Previous Article bmwbaxter Benching Bulldozer Live Tonight! I just wanted to put a note in the first comment that Gigabyte does not yet know when Revision 1.1 will be available in the US. If they let us know that information, we'll definitely edit the review, but as of right now only Revision 1.0 is available. Basically, it is my opinion that this board was not good enough to be "Approved", but that it also was not bad enough to be "meh." It doesn't deserve a "meh." because on its own merits, the board is solid and does what it purports to do pretty well. There are issues, but like I said in the review, nobody's going to blame you if you choose this board. It also doesn't deserve an "Approved" because it isn't priced right for the simple reason it doesn't live up to its competition. When the review was written, the UD7 was a mere $5 less than the Crosshair V Formula. IMHO, the Cross V is the superior board. 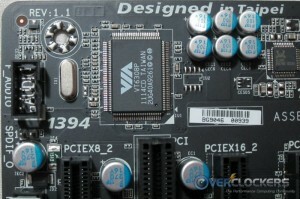 Its power section holds voltage even under LinX, which the UD7 does not. It does not have some weird clock throttling problem, which hopefully will be addressed in a BIOS from Gigabyte but has not to date. They are aware of the problem and rather than hold the review they said go ahead and publish it. 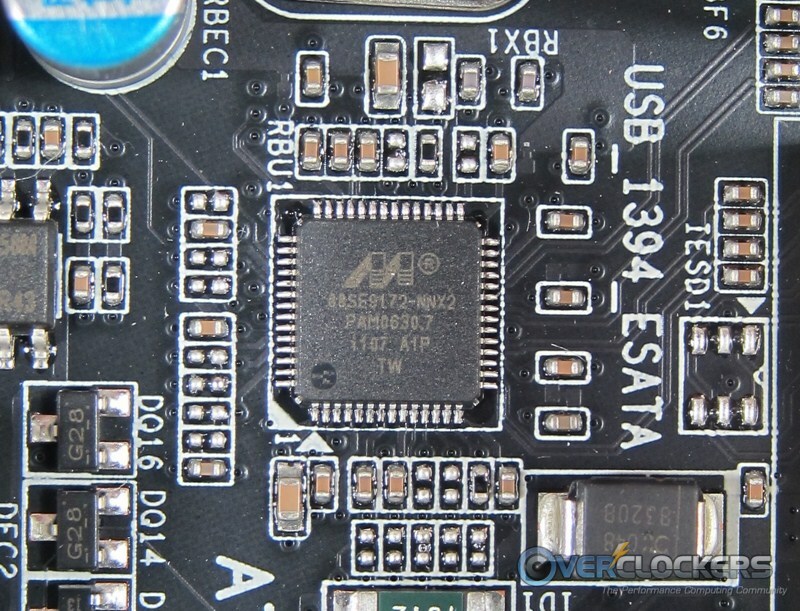 Gigabyte's Easytune 6 doesn't even get close to ASUS' AISuite. 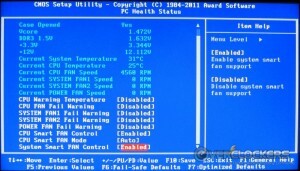 For those that use extreme cooling, CloudOC requires tinkering with a firewall to get to the computer in the first place. Those that do bench under extreme conditions often don't install network drivers, which isn't possible when you have to use the Cloud to OC. It's not a long list and somewhat nit-picking, but it all adds up to a board that is decent on its own, but not as good as its competition at the same price point. The new revision sure seems the way to go! 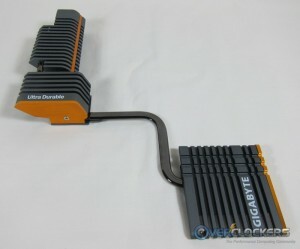 I wonder if Gigabyte is planning on offering a new updated revision for the UD5? If so the lower price point of that board with corrected vdroop options would offer another choice for those considering AMD. 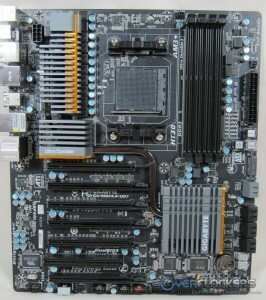 I have this mobo with BIOS version F6. 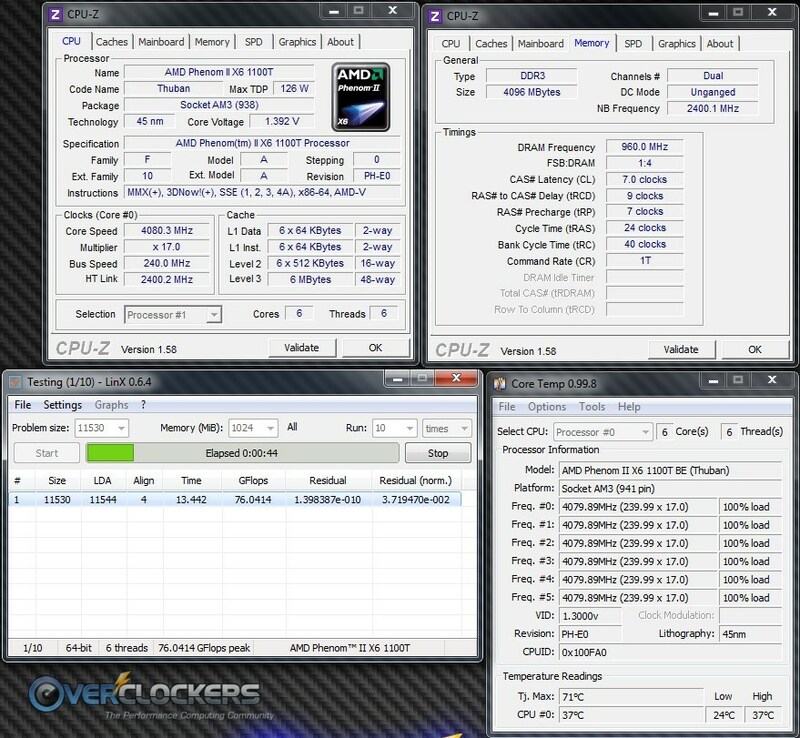 I have overclocked my Phenom II 945 from 3.0GHz to 3.6GHz and ran Prime95 blend test for 14 hours with no problems. The vdroop issue doesn't appear to affect my overclock stability at all. It may for more extreme overclocks, but mine has been very stable thus far. 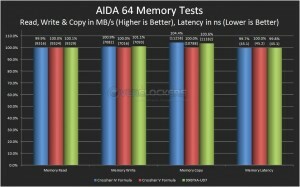 The 945 should be fine as a quad core. It's hex- and octo- core CPUs that really pull it down. I've seen several people report being fine with quads. 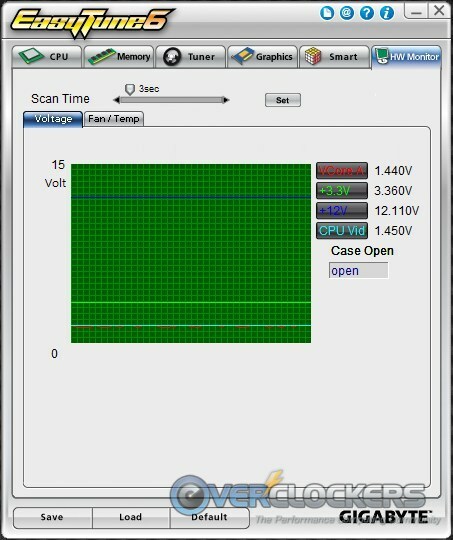 Even with six and eight core CPUs, it's not that Vdroop affects stability; you can always add more voltage so that the loaded voltage is what you need it to be. My issue is that the massive Vdroop forces you to run much higher voltages than you should need for 24/7 use at idle. With LLC, that's a non-issue and you can set it such that you can run the same idle voltage as loaded voltage. 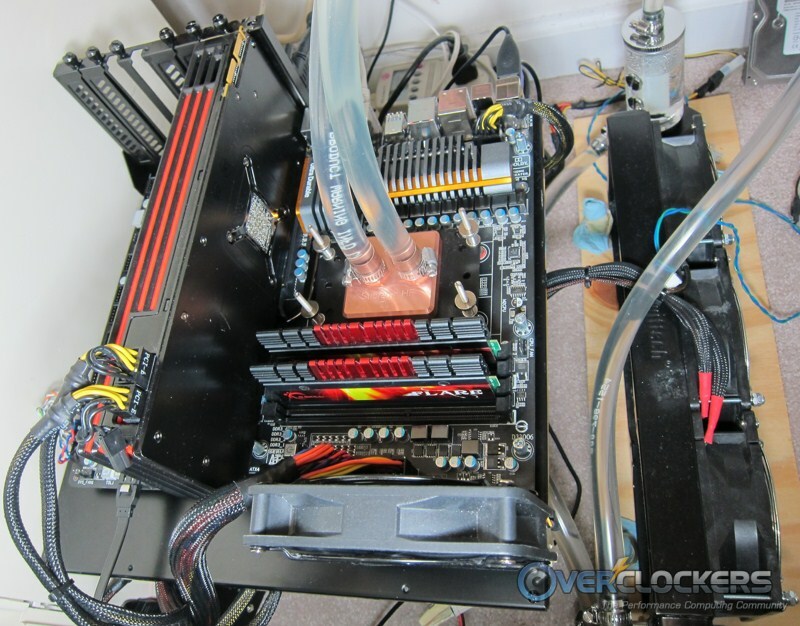 Then, yes, for extreme overclocking that Vdroop is a big problem. When you're running 1.8V for benching, you don't want to have to run 1.9V+ just to get 1.8V loaded, you want what you set to be what you get, idle and loaded. Okay so no worries for me then. Great review by the way... I've had this board for about a month now and have been very happy with it. Looks awesome inside my NZXT Phantom. It was mentioned I might want to clarify the reason this board received no award, which is a very valid concern. It should have been done in the review, but we have comments that appear on the front page, so it's not that bad. I'll edit this into the first comment too. So no green stamp of approval? Nope, not this time (see post #8). Yep, they already know about the LinX Vdroop and clock throttling. I didn't specifically tell them about Easytune 6, but presumably they know that was a hack job compared to their Intel boards. Thank you, a very good reviw.